1st snake seen in the year — of a garter variety. And right smack dab in the middle of Epsi. This (fox? coyote?) skull was found on the limits of Epsi as well. And I unearthed not one but 2 thigh bones of probably the same animal in the clearing also containing the snake. Don’t think I’m going to be creating an art happening here. Seems a bit cursed or sumtin. 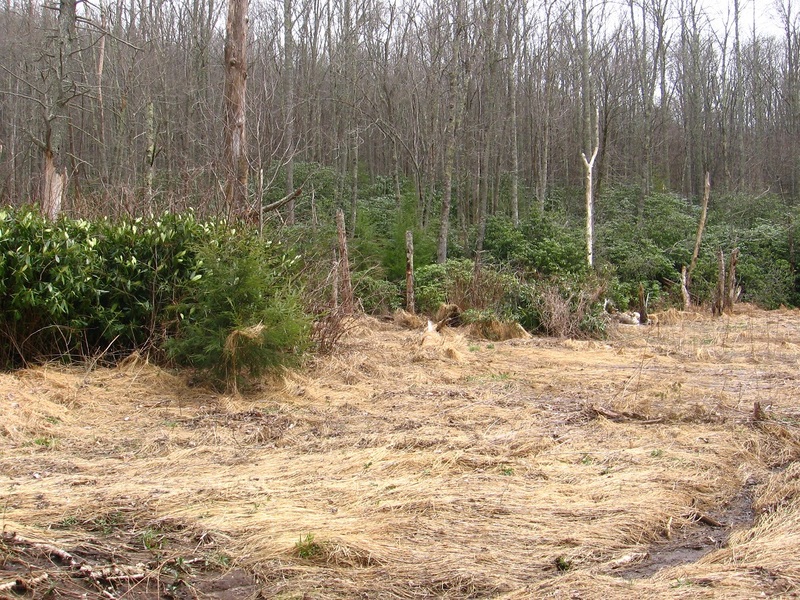 And it’s hard to reach through the several patches of rhododendron you have to climb through to get to this clearing. Falmouth Creek is looking better and better… get to that in a moment-o. 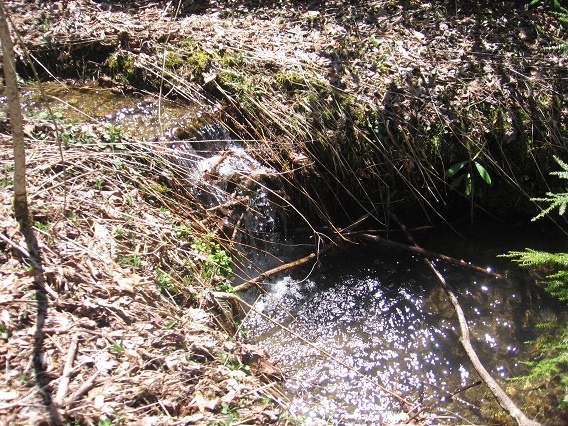 … if it didn’t exist here beside this considerably smaller spring just upstream (but still the only other spring I have identified for Falmouth Creek). This weekend I impromptly inserted all the bottles found toward the mouth of Falmouth Creek several weeks before into the metal circle also transported from that same location. All 34 or so bottles fit within, with room to spare. Is this true Old Baker Settlement? 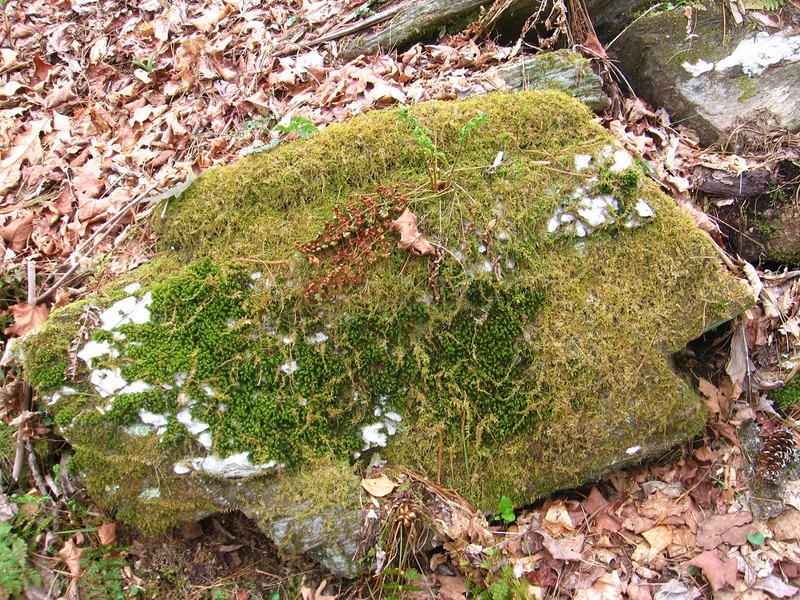 Or is it the rock encrusted moss bank just in front of it, directly above the small spring here? 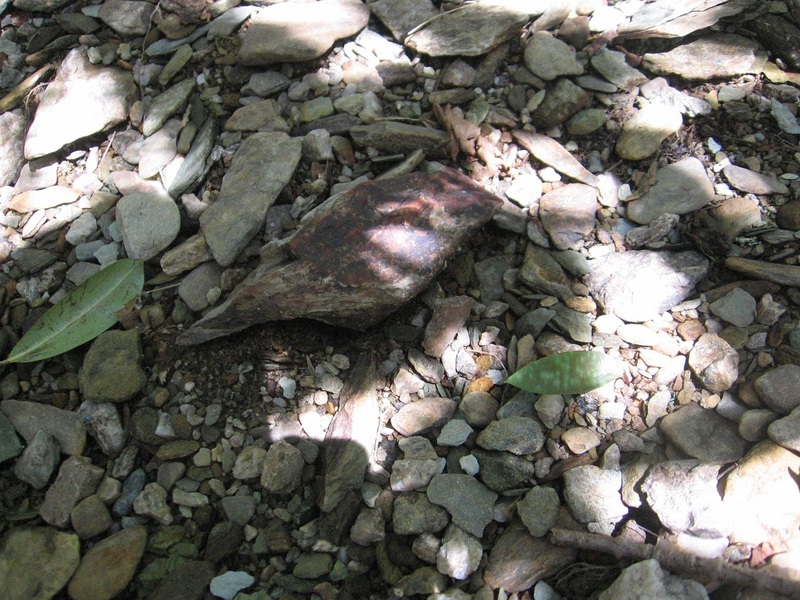 At any rate, the two “clusters” (bottles and rocks) seem related. Separate but related. Old Baker Settlement (?) can be divided into 3 logical groups of 11 bottles around a central, moss filled clear bottle, an obvious omphalos. This may be related to the classic T and O maps of antiquity as well. The densely packed nature of the community of bottles also certainly reminded me of the same in my also recently created PTG Town on the Maebaleia continent of Second Life. Since “Fi” is near each, as I’ve already discussed a bit in this earlier blog post, I believe there may be a direct resonance going on. Are the 2 communities the *same* even?? And taking this another step, is the separation of the 33-34 bottles within the metal circle and the nearby rock encrusted moss bank the same as the gap between present Planet Earth and an extraterrestrial race or races? Had to cross my mind. 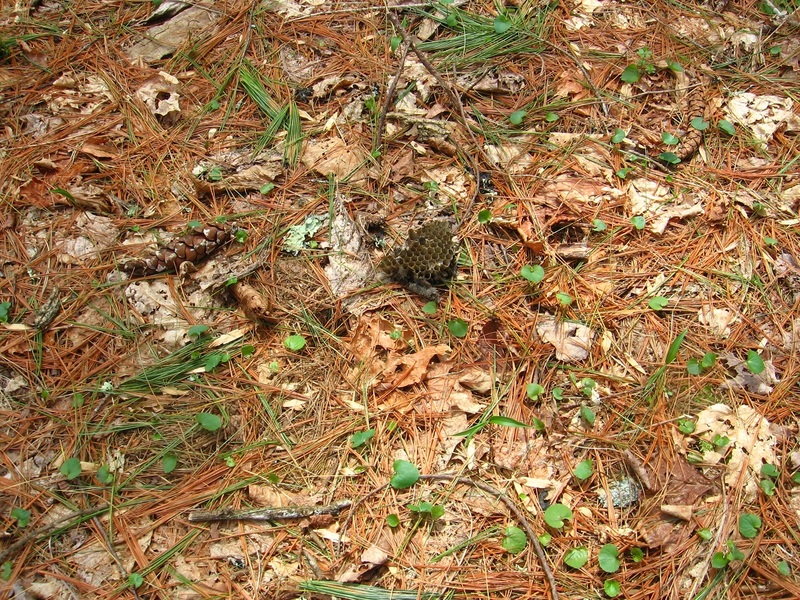 Another visit to Whitehead Crossing, which I’m seeing more and more as a true center for my woodsy experiences. 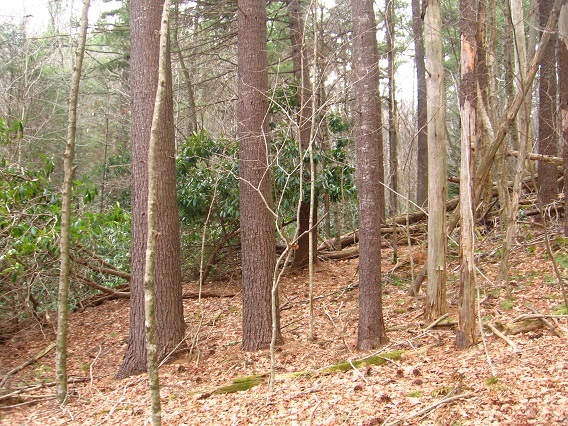 Like I said previously, it’s actually a quite large and diverse region we’re talking about here, composed of a mixture of different types of woods and open areas, kind of surrounded or protected by a thicker forest of pines. Through the middle runs Whitehead Brook, acting as a type of unifying thread. 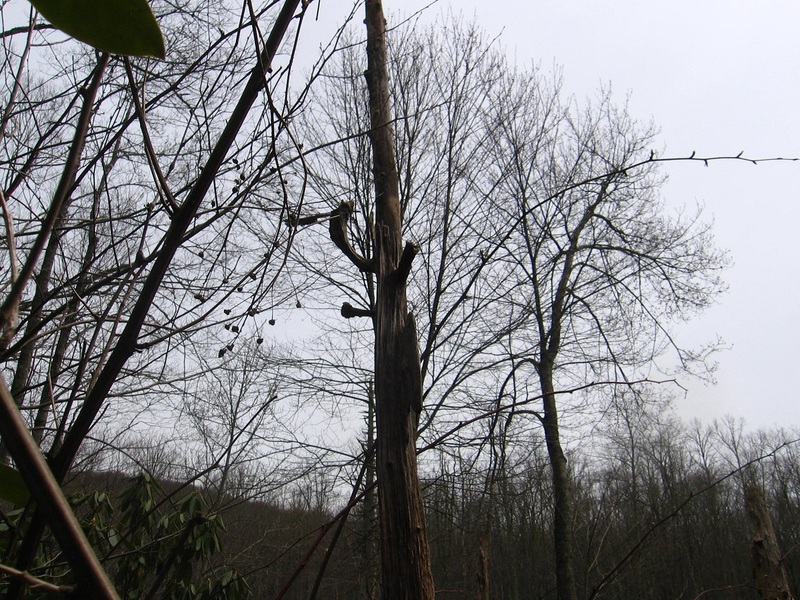 Below is pictured one of the many little oddities of this area: a tree seemingly lassoed by a trailing vine. I didn’t create this just to make a picture, I promise. The now blog famous Jeogeorock or Gray Rock in the distance, with an unnamed spring passing it on the right in the below photo. 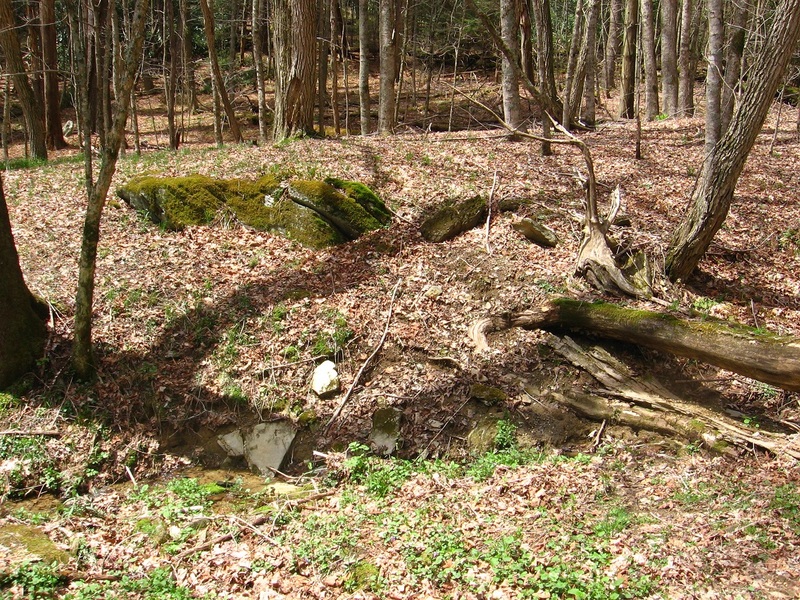 The spring’s source is in the foreground. Jeogeorock and neighboring, squatter and smaller rock, also unnamed like the spring in front of it here. 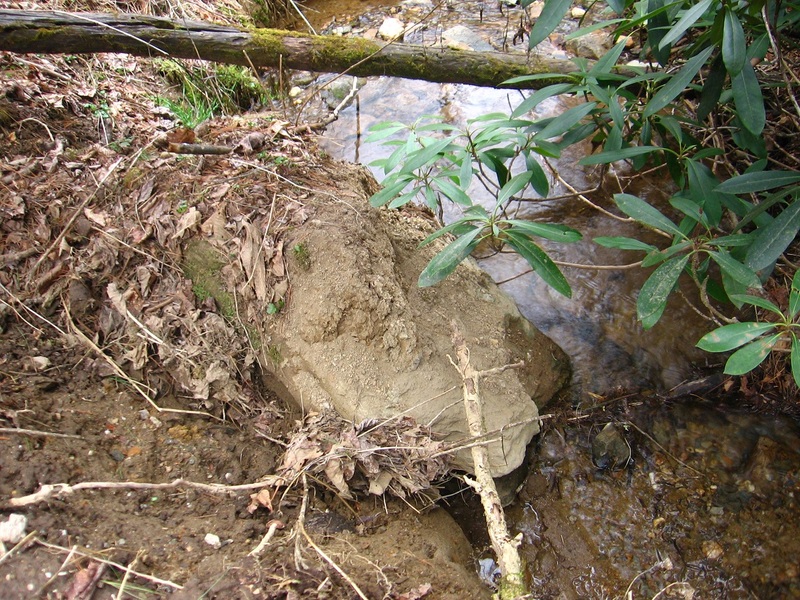 Although Jeogeorock is the largest specimen of such, there are many rocks scattered about Whitehead Crossing, including these which seem to have been piled up to make a type of fence or barrier of some sort. 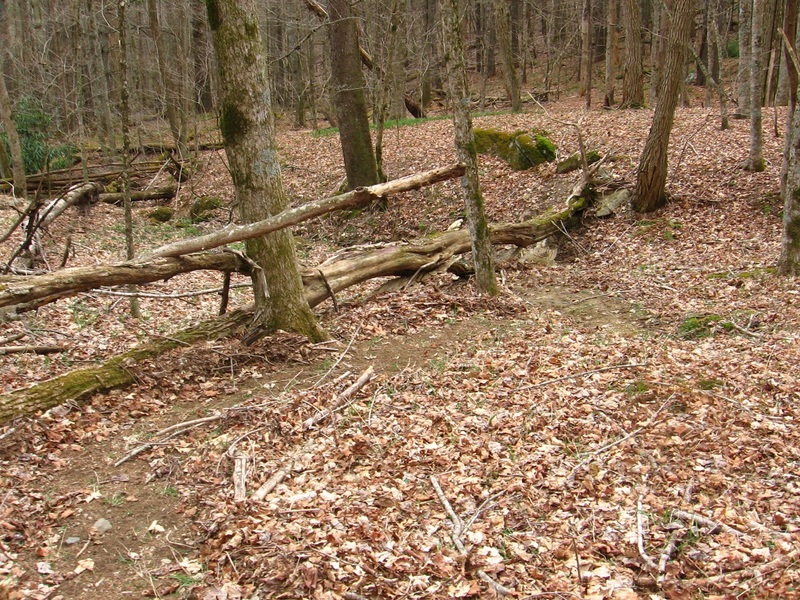 This jumble of fallen trees also seems to act as a defining line between Whitehead Crossing proper and outside regions. 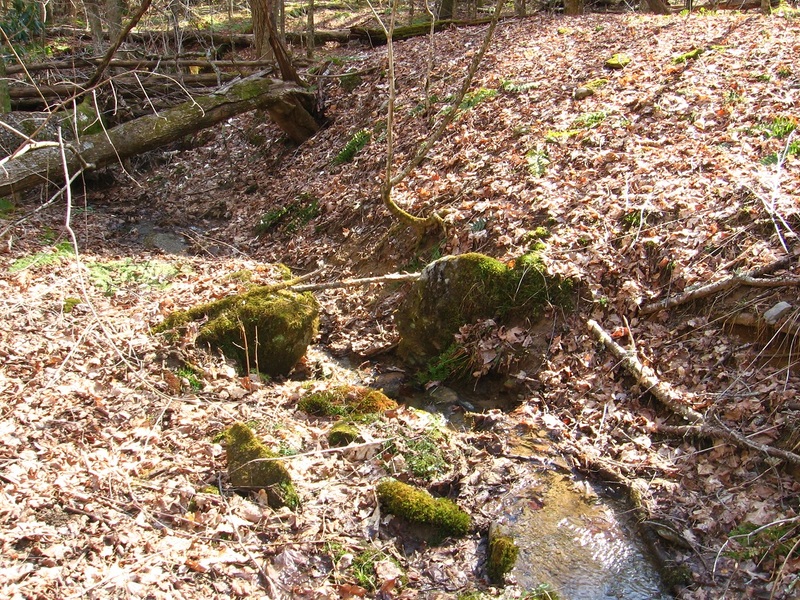 A candidate for the center of Whitehead Crossing is this finger of land between two stream flows: Whitehead Brook behind it, and another as yet unnamed spring in front. Notice the topping green of this low ridge — grass apparently stays alive all year round at this spot. Trees forming an almost equilateral triangle in the northern part of WC. 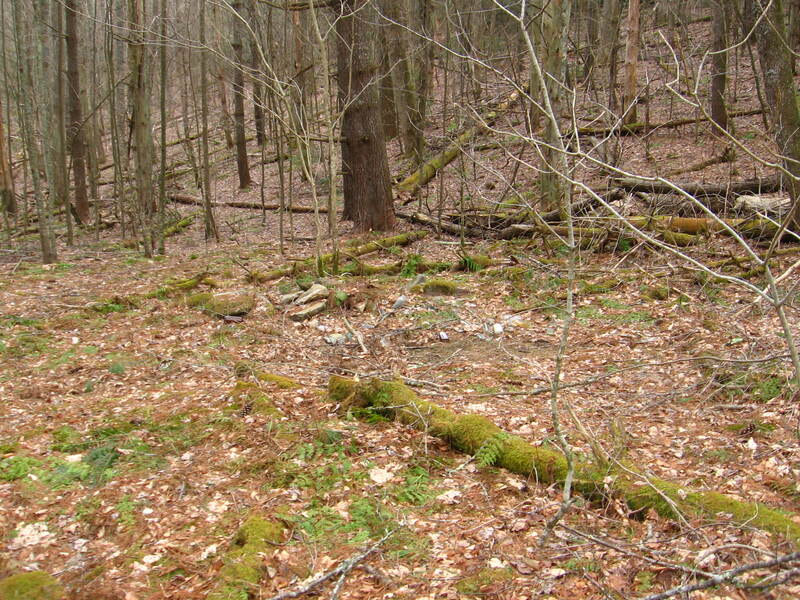 They point to the ridge pictured above. 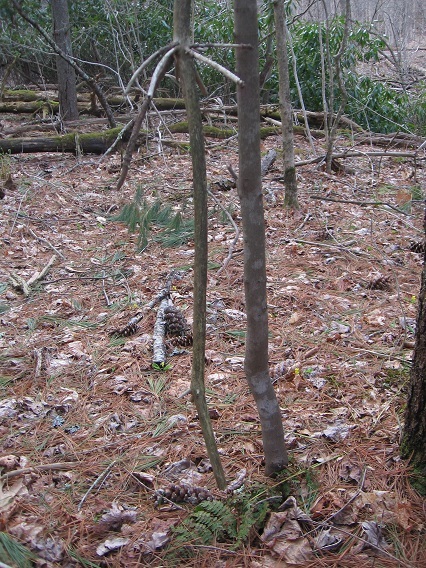 A look into some of the thicker pine forest just beyond. Jeogeorock’s unnamed partner rock already mentioned above. Isn’t this place fascinating?! Mall Meadows was a confluence point between human or humanoid toy avatars, mossmen, and bees. Perhaps others. The huge mall there was famous for its 5 shot lattes. Depression still there. “Obvious that Rock, the toy avatar, sat on Rock, and probably for numerous times and long times.” I melded one with the other in me mind. “You need to write this god in the sky,” came the mystery entity’s reply. Across space. Across time. “So why did Joe Flo Zoe Mo plug up the bee’s hole at Greenhead?” he then ask, staring at me with his blue blue eyes so deep. Krakatoa. There is a battle shaping up for control of future rock temples/land art between Dongoba and Whitehead Crossing. Who will win? My personal guess is that there will be no losers in this contest. It’s all just meaningful nonsense in a box canyon, thanks to that Roostre fellow/dude. “Yes,” came the reply. He was a type of God. 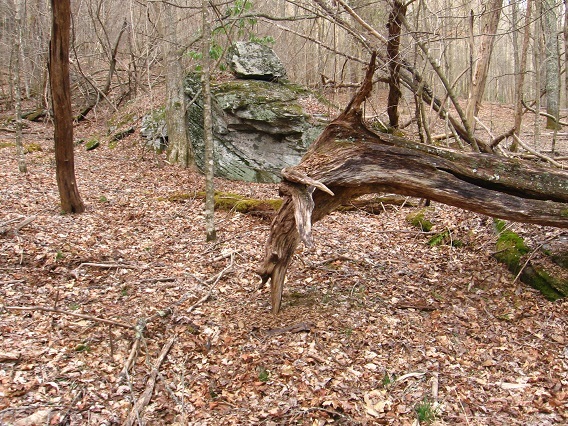 Here are some pictures of the many interesting rocks in the general Whitehead Crossing area. Below we have a rock with a bald spot of sorts. 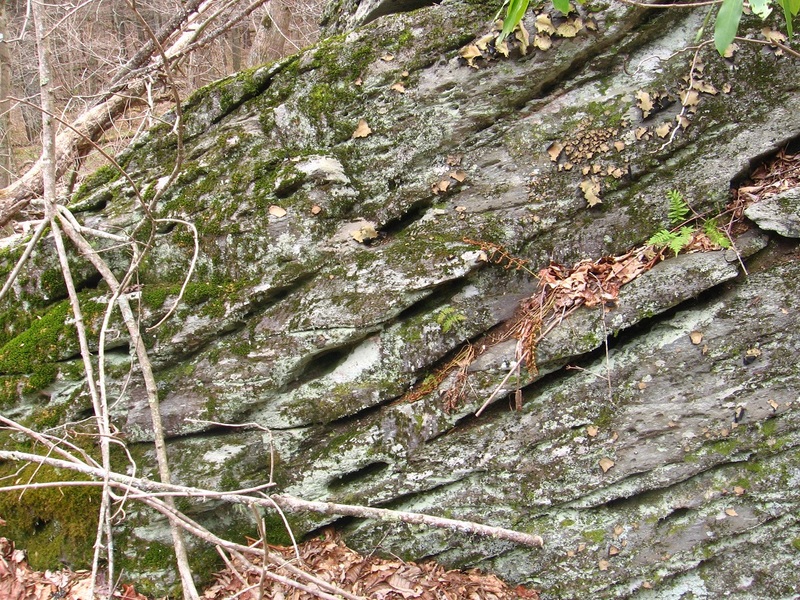 This one is from the side of the smaller of the two major rocks in the area, or the neighbor to Geogeorock (a.k.a Gray Rock). It seems to act as a pointer, almost. This is a slightly iridescent rock at the base of Geogeorock itself. We’ll get to a more interesting example of this quality in a moment. Opened nuts on a mossy log. More alien communication or random configuration? 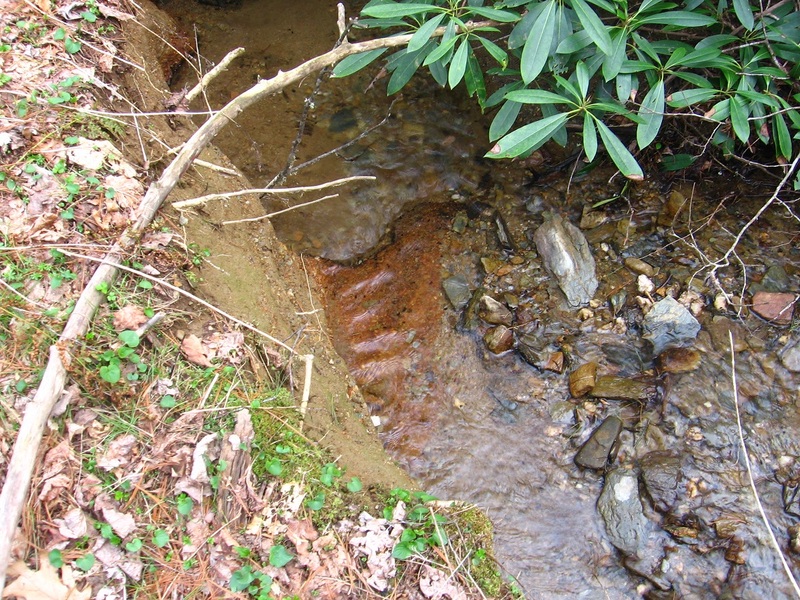 Flat and smooth rock below Geogeorock, in what is a water flow during heavier rains no doubt. Geogeorock itself taken from about the same position. Not a rock but an interesting red pattern of mold on a nearby log. Certainly gives the appearance of paint. Heart o’ Whitehead straight ahead, with that mysterious patch of evergreen grass to the left. I suppose I’ll have names for all these rocks soon, or at least numbers/letters. If what I think is evolving here comes to fruition down the road. 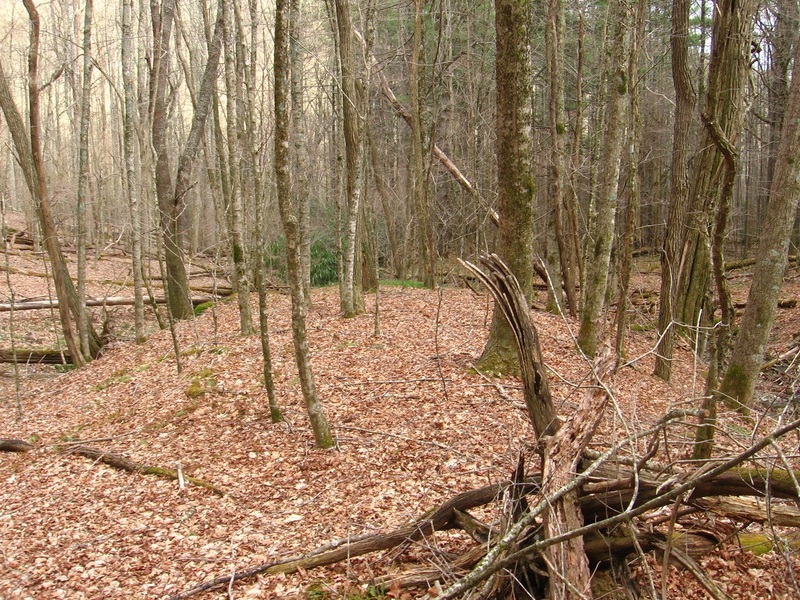 … and Whitehead Brook on the other side of the grassy ridge. Direction Rock can be seen in the background, one of the presently named rocks (subject to change, however). A fence post near the top of the ridge pictured at the bottom of the Whitehead X-ing 02 blog entry. 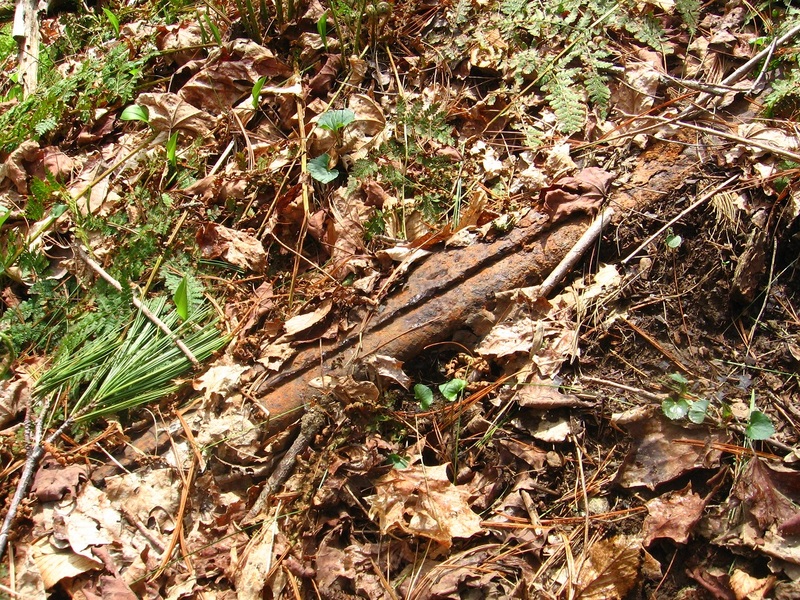 Some fragments of barb wire are still attached, marking its past function. 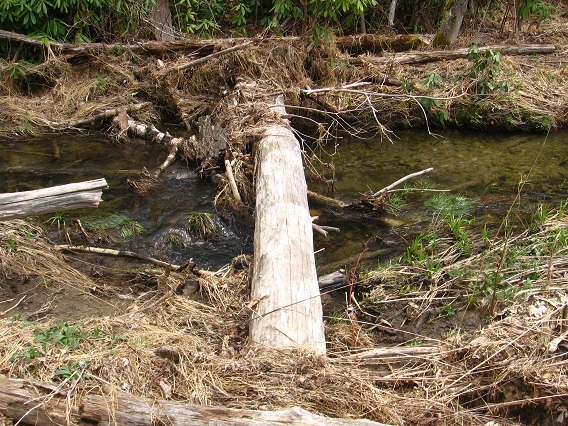 Anyway, below we have a quite interesting log bridge across this flow. Detail of rock from this same ridge. A secret star map? 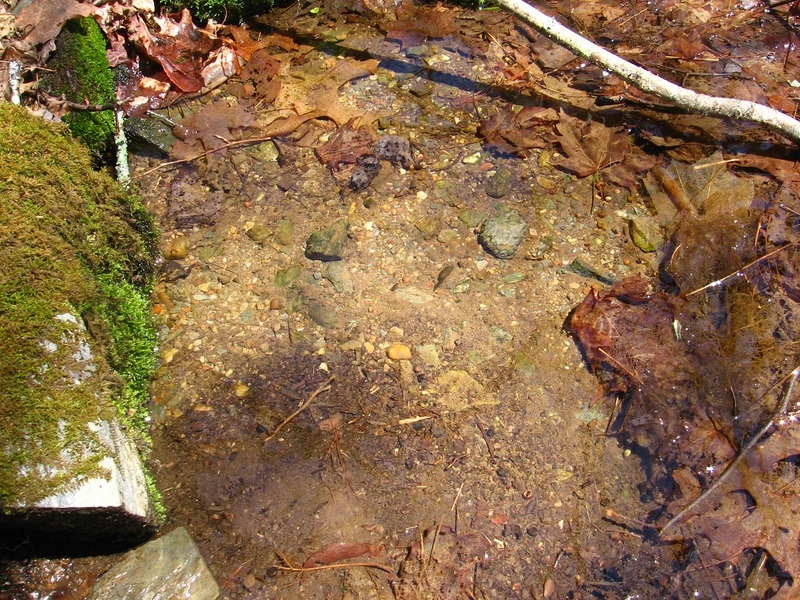 A quite iridescent rock in the Whitehead Brook flow nearby. Not sure what the involved mineral is, but it gives the appearance of an oil film. Then just a bit upstream from that, even, we have what I’ll call Remorse Rock. 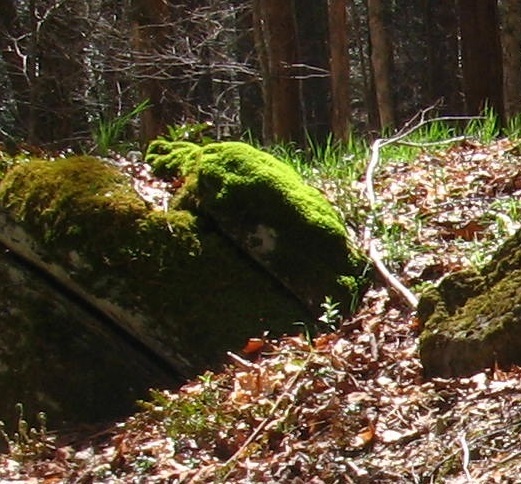 A look across a line of mossy logs into Rock’s Meadow, with Rock’s grave and also The Arena (alternately, The Lycaeum). 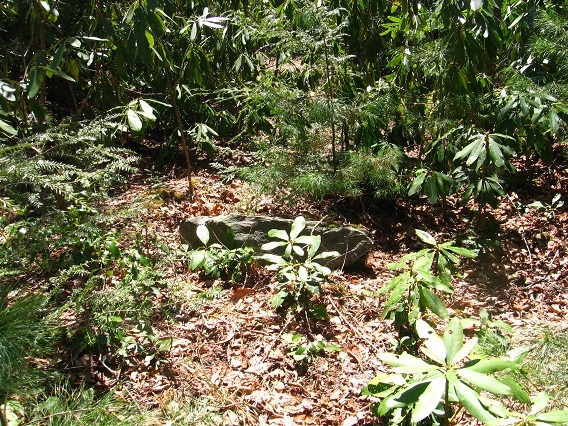 Rock’s Meadow itself: grave foreground left, The Arena background left, and “Rock’s rocks” background right. Soon this will be filled with green grass. Nice! Old road leading out of Whitehead Crossing to the south. Unusable now, of course. But did it once service a human dwelling spot in the area? Wish I had a time machine where I could go back in the past to see! 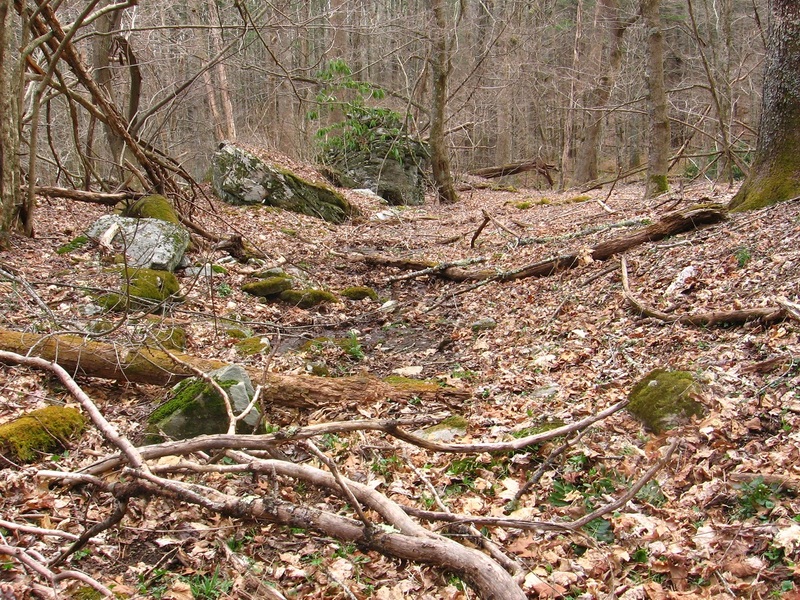 This old road meets with Main Path (main or really only hiking path in the general Whitehead Crossing area) at this spot, which could be a type of proper entrance to Whitehead X-ing itself if it was a public place. It’s definitely not, however — want to keep this location hidden as much as possible down through the years. This is a shot of the Main Path, which we’ve headed north on from the last picture about 50 yards or so to reach this area where it winds through some interesting rocks. 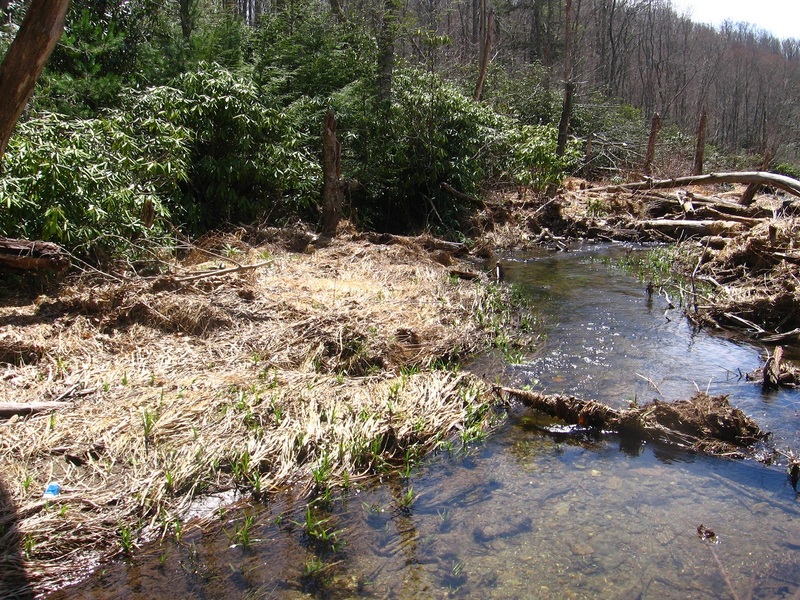 We now move away from Whitehead X-ing to Norris Brook. I was very disappointed to find that the largest temple of Dongoba had collapsed or *been* collapsed since I last visited in the fall, probably. Since the tall, 5 rock Dongoba temple, or, properly, a cairn (as are all the temples here, properly speaking again) has also been knocked over, I’m strongly thinking that vandalism is the reason involved. My mind turned back to the crosses made near the mouth of the creek and also on the central rock, as 1st pictured in another Baker Blinker Blog post. I’ve reposted the latter photo here. I’m thinking that the Christian humans who made the crosses might have also come across this temple complex and thought them to be idols to a false god. Crazy concept… or what actually happened? It then occurred to me that I could move these temples back to Whitehead Crossing and rebuild them. So I returned across the ridge to examine my new home base closer. I entered from the south again, Green Stream below me now. 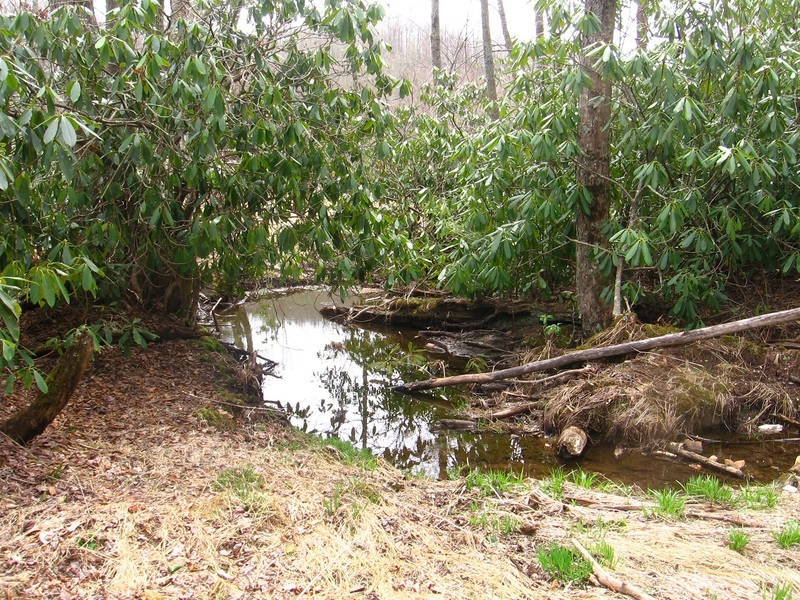 But I didn’t make it into the heart of the community again, halted by further exploration of this stream. So many rocks here for such a relatively small flow of water! Very similar to what I encountered at the the 2nd Portal on Spoon Fork the week before, except the rocks were not as large nor widespread. Still a comparison can be made. Whitehead Crossing is long, is deep, is wide. A big box. Play. Yes. That was a center. Way. I’m going to start to create a UmapS database modeled or substituting (sumtin) for the one at Gnirps. Or GNIrpS. What means the marriage of parks Frank and Herman at that spot, Hucka D.
Red. Green. Sister. Brother. Balance. Balance between red/silver and green/gold. Map Rat knows. Hi Map Rat. Welcome to the blog. I know. Iffy, isn’t it. Not sure, Map Rat. Are you from Missouri? Yes. Sunklands. Crawled in a long time ago. Wide. Deep. Long. Gnirps is just the outer or exterior side of an interior complexity. Output, then. Yes. Gang of Willard. Hobart. Krakatoa. I’m getting all sorts of clues that Frank/Herman mythology is jumping up a step presently. Is this because of my focus on Whitehead Crossing? Yes. I am suppose to say yes here. (sound of change dropping in a plate) Thank you Hucka Doobie. Are you being tipped, Map Rat? Only what counts. I can help with Gnirps. You have Con Creek and Damsel, Missouri. You have… you already have a lot. If you can draw around Whitehead Crossing for information that might be best (sound of more coins dropping in a plate). Thanks! I’m uncomfortable with you being tipped, Map Rat. I think. I’m counting. 304. (pause to refresh) 306. Are you being paid according to number of words in this post, Map Rat? Up to 327 now. 329. 329 still Oh, 330. 330. 332 now. 333. Map Rat? 333 still. 333. 333. 333. Hmmmm… stuck on 333. Wait… 338. Are you finished? You need to start on another Whitehead Crossing Map. That’s what you need to do. You know (sound of coins again) — thank you Hucka D. — you know about Red Head, and how the Mossmen lived there but its hard to get inside. They didn’t want other avatars in there, but there was certainly a Big (sound of coins again) Lot of ’em in there. They met the bees, the humans or humanoids, at the Big Mall. Whitehead Crossing, Greenhead, and Red Head all in one. Norum. I think since Greenhead, the only UmapS version, is near both a Grassy Lake and a Little Grassy Pond, that Grassy Knoll has to be involved in the history of Whitehead Crossing. One element (sound of clicking coins). Thanks! You’re getting pretty rich, Map Rat. Wow, a Deadening Cemetery nearby, Map Rat. Or Hucka D. What a name! (pause again) But of course what I’m looking for is Red Head along this line. Oh, it’s the other direction. Big Blue Lake in-between, and Little Blue Pond. Marbles don’t you think? Is there a square inch of Monhegan that has not been painted? Perhaps it is the silver light that dances off the mirror of the sea or the fog that softens the landscape that has lured painters here since the 19th century. Oh look, he’s talking about Billfork, Lion’s Roar (etc.)! Fairy House, Monhegan Island, Maine. Strange — this same blog features several posts on Whitehead, but Alfred North Whitehead in this case. One of the primary summits of tiny Monhegan Island, and around which I’m sure are found a goodly number of those fairy houses like the one pictured above, is named Whitehead, and that was what originally attracted my attention to it (not the fairy houses, which I just learned about in the last hour). This would be in resonance with the previously named Whitehead Crossing of Frank Park. Speaking of which, I’ve just yesterday restored the 5-rock cairn at Dongoba, and might work on re-creating the biggest temple of the complex this spring/summer/fall. As I think I stated below somewhere, I decided not to move these 5 rocks just across the ridge to Whitehead Crossing for this restoration. The same would go for the bigger temple — rocks simply too large to move from this location, to name the major obstacle for this transfer of art. 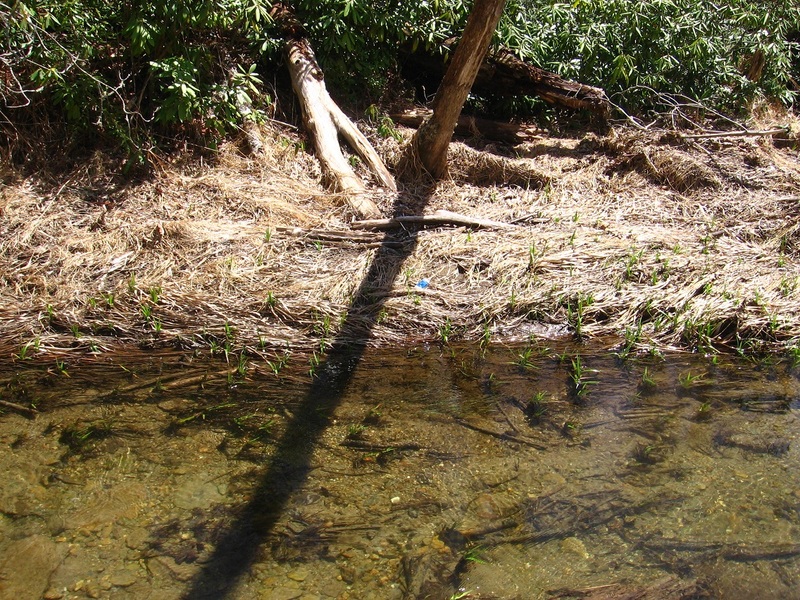 So here’s the scene now just below the root end of Concreek’s floating tree on The Island (compare with here). 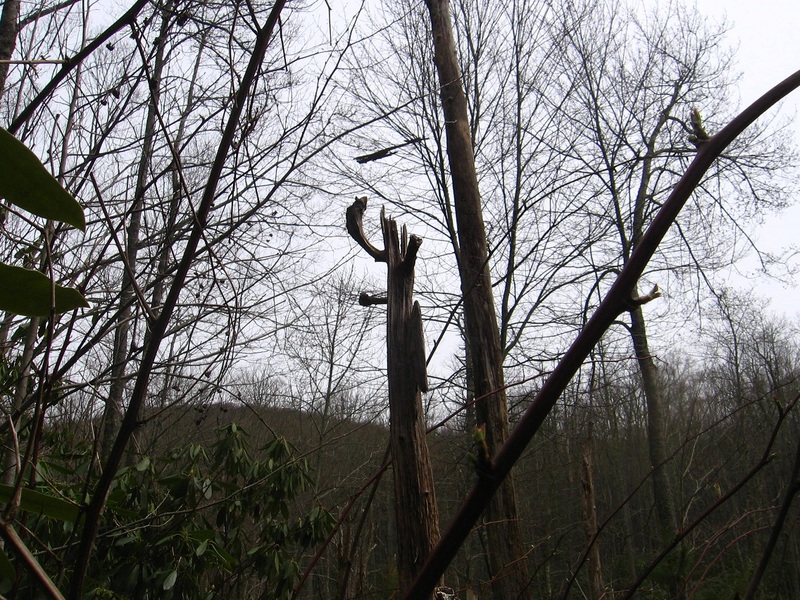 The broken off rhododendron branches, 3 in number, certainly *appear* to be placed here on purpose by human/humanoid hands, but, as they say, the medium is the message. This is land art, but also a communication, more direct and unambivalent. As I said, I believe it is a map. 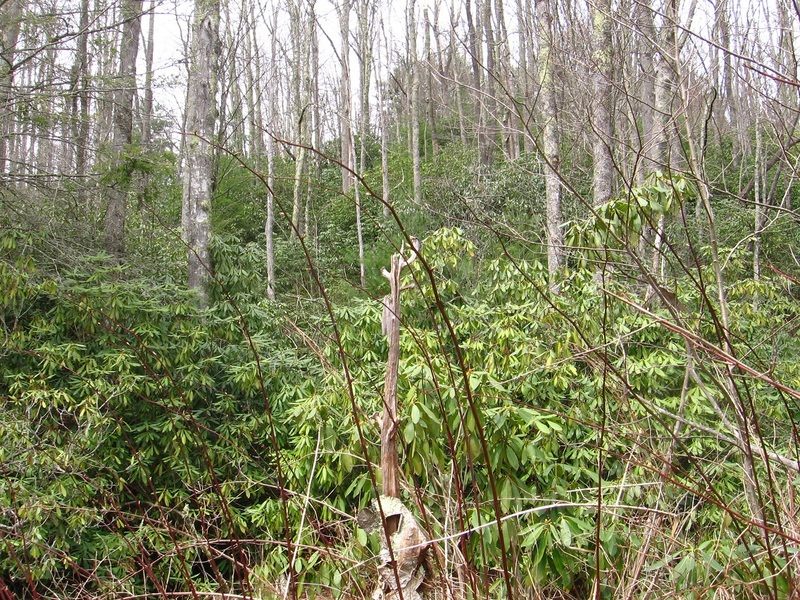 One of the first things I noticed upon stumbling on this configuration is that the two larger rhodo branchs were placed one behind the other, but with a certain distance between them. I interpreted this as one *following* the other, and thought of the aliens following *me* across the road from Bill Mountain and to Falmouth Creek across The Way. 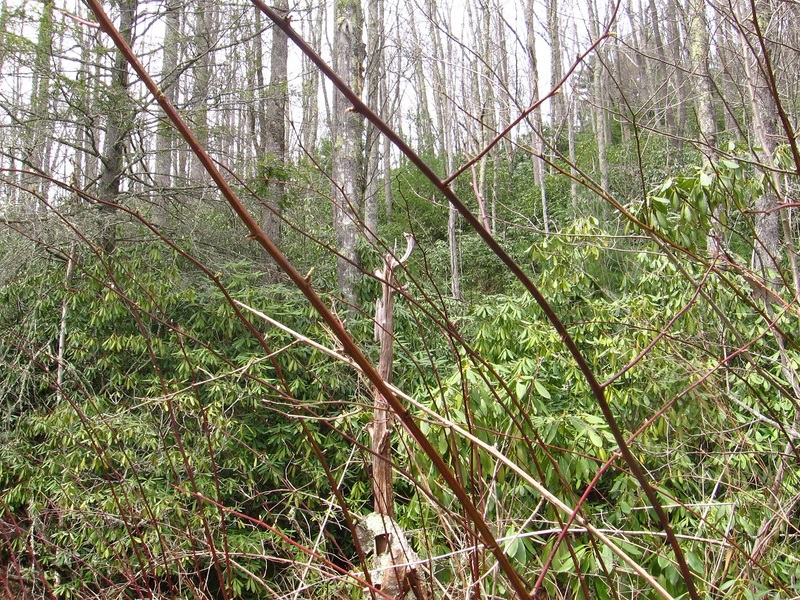 Notice that the rhodo branch closest to the floating tree’s bottom is prominently forked, and that a 3rd, smaller rhodo branch lies above the forked branch in the following photo. 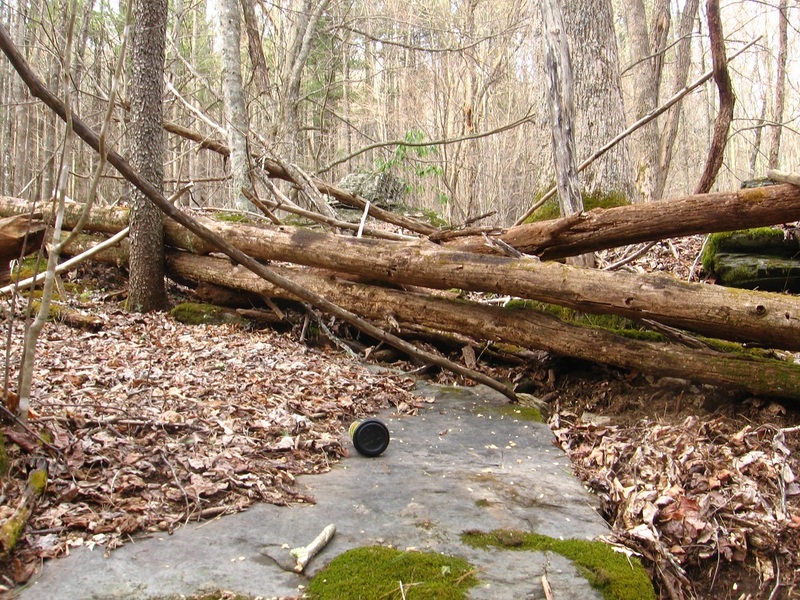 I interpreted this — again all this fell together or happened almost “at once” — as the path I created to Falmouth Creek and the art happening (set up bottles in a metal circle) there at Old Baker Settlement. 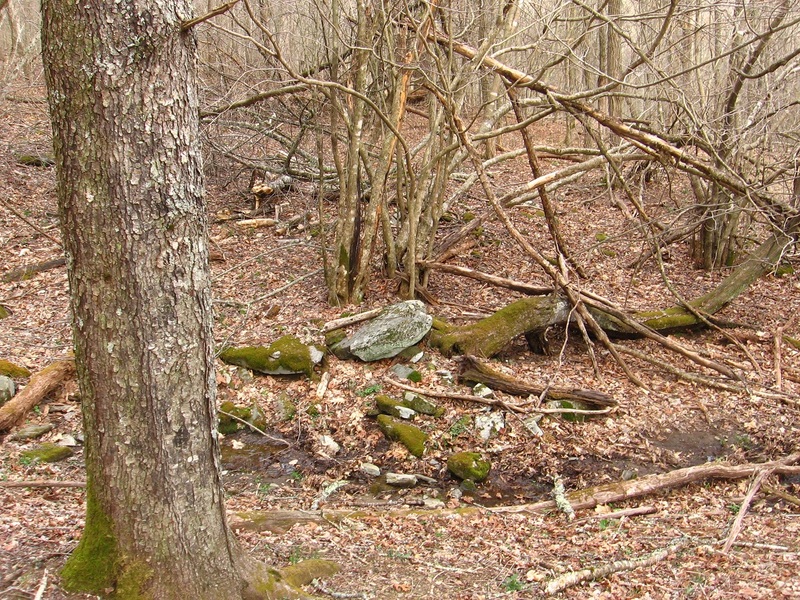 I believe the “aliens” have taken the fork from the main path or road running alongside Bill Mountain and across The Way (represented by the 2 larger rhodo branches) and have gone to the art event to take a peek, at least in a remote way (perhaps through the pictures and texts of this blog). At any rate, they wanted to communicate this knowledge to me through the map. 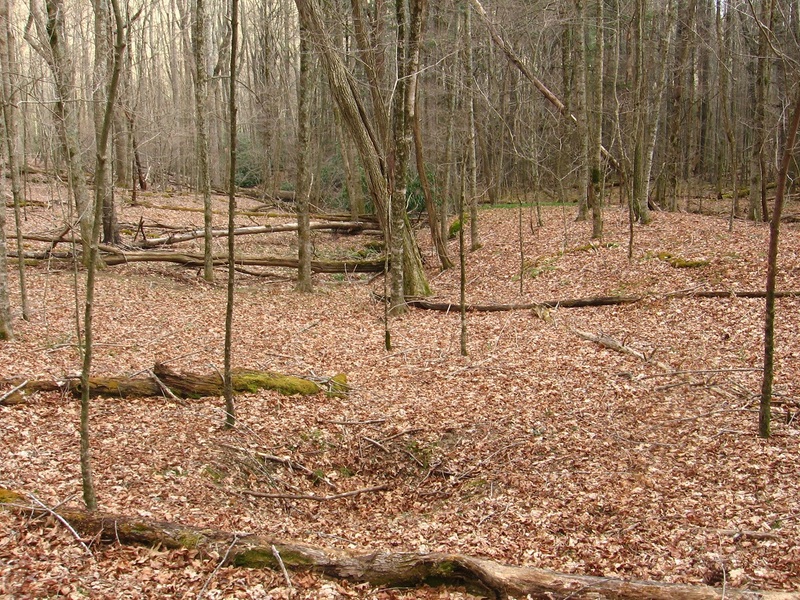 And continuing down the main fork would bring them to Concreek, and they had to come here obviously to place the branches — i.e., make their map. I know this sounds odd, but that’s what I strongly believe it is. And it is akin to crop circles in that the circles tend to use the same fields year after year to affect their own brand of alien-to-human communications. Needless to say I’ll be paying close attention to this floating tree in the months and years to come, with any further messages chronicled for this blog. At least I *hope* that’s what they want me to do. One more thing I should mention about this configuration. 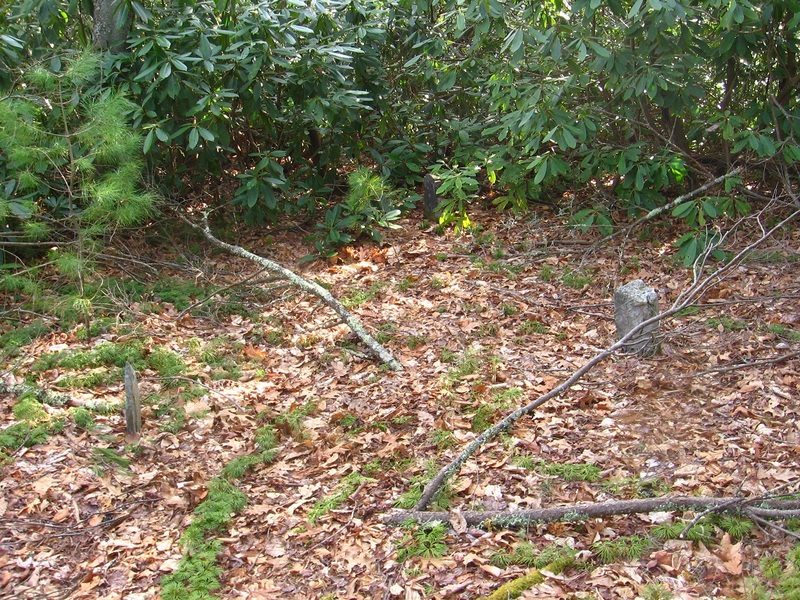 There also appear to the right of the smallest of the 3 broken off rhodo branches two slender but quite sturdy “roots”, looking almost like antennae. This didn’t seem natural either, and I couldn’t figure out if these two very similar “branches” were actually roots or stems of some plants, or if they were broken off in the first place. I may have to return to this spot for more investigating, then. Shifting now to a totally new blog location, we have Fi, certainly not as mysterious as Concreek yet, but still worthy of inclusion here. The place is in Frank Park once more, and somewhat between Norris Branch and Whitehead Crossing, southwest of the Woods of Howl. The two creeks involved, both tributaries of Green Stream like Whitehead Brook and Concreek, have also not be discussed in this blog yet, but come together not far downstream from the site of the below pictures (which seem to indicate several lichen tinted, derelict *temples*) These are just some preliminary photos, and I’ll return to this location soon for more blog storytelling. A preliminary name for this “temple” site is Fifill, and there seems to be a complementary and perhaps antagonistic Fifole to deal with here as well in this Land of Fi. Solitary white rock that seems to be an indicator of something. Geogeorock or Jeogeorock or Jeogerock is not the title of the Whitehead Crossing rock but a *type* of rock, which connects with the Jeogeot continent of Second Life (= My Second Lyfe). Instead the actual name is Grey Rock, sometimes misspelled Gray Rock. 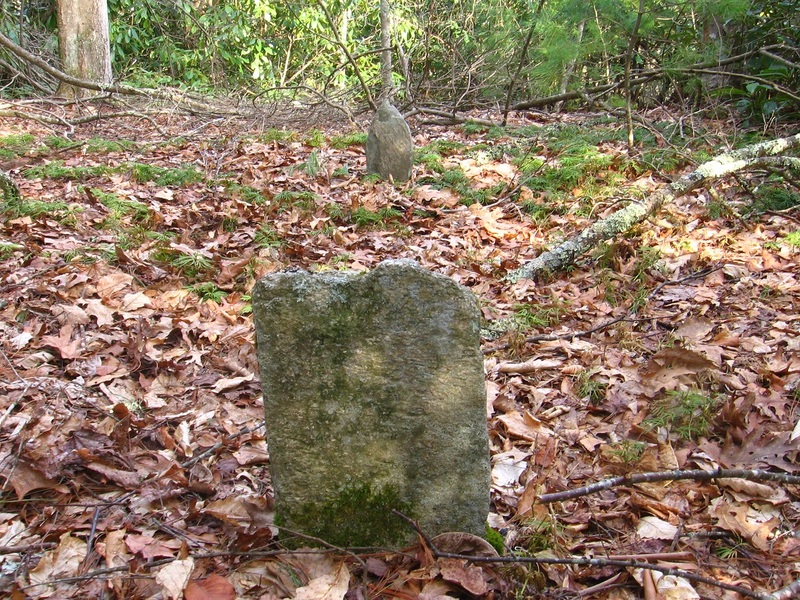 The resonance of for Gray, Maine, which has a lone (gray clad in battle) Confederate soldier in its Union cemetery, a grave which is tended the same as the rest. Gray, Maine is or was also home to one of the few galleries in the world named Blue Feather Gallery, and on a Brown Street ta boot. My own (virtual) Blue Feather Gallery reached its peak in Norum, when it bordered Chilbo also at its peak. This would be in August 2010, close to 3 years ago now. Norum comes from the sim Noru where I owned land at the time (and where BFG was). Only US Norum is in Washington County, Florida near Whitehead Crossroads and a Greenhead and Red Head and also Poplar Head and Orange Hill. More colors. This is a direct resonance, then. Only Norum/SV in US besides this is Norumbega, Maine, another direct reference and reference to My Second Lyfe through nearby Nautilus Island, reachable through Whiteheads. Today I revisited Whitehead Crossing, which I will probably do tomorrow as well. Didn’t take a lot of pictures because of tiredness. Made the mistake of eating a full meal in the middle of the day, which is unnatural for me. Threw my whole metabolism off. Learned a lesson. 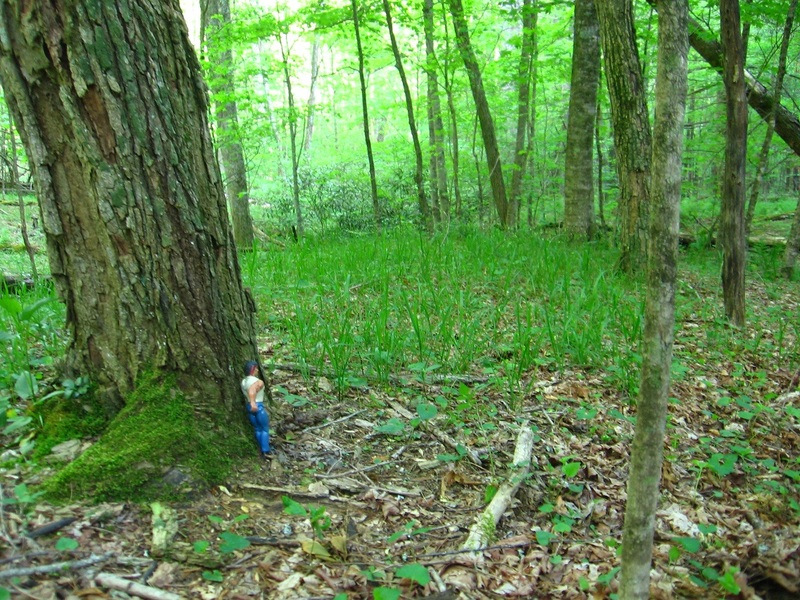 But to Whitehead: Perhaps a major discovery there still in the finding of a *fairy house*, as well as a fairy field. This just on the other side of Green Stream from Whitehead Crossing, and probably a part of its “metro area”. I’ll attempt to take pictures today. 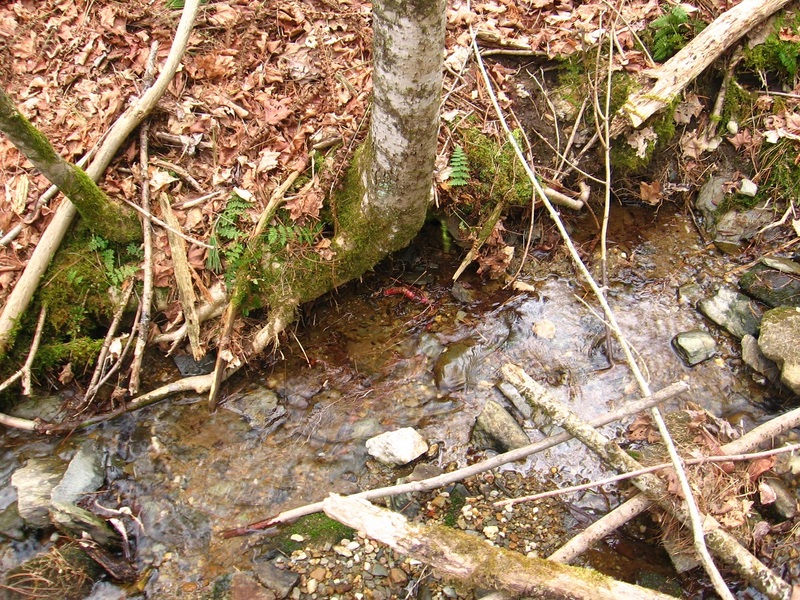 Named the only other stream in Whitehead X-ing besides Whitehead Brook *Little Whitehead*, and then later that day learned that there was a Little Whitehead as well on Monhegan Island (along with a Whitehead itself). To emphasize this resonance, in a google search for “little whitehead”, my blog comes up among the top hits now, along with an art group made up of people whose last names are Little and Whitehead, and then Monhegan Island’s Little Whitehead summit. Too queer! The assoc. between my Whitehead X-ing and Monhegan I. would have been made through this phrase if it hadn’t already been made through “whitehead”. About the only thing I’ve said about Little Whitehead (my stream) specifically in this or the Baker Blinker Blog is here, where I assoc. 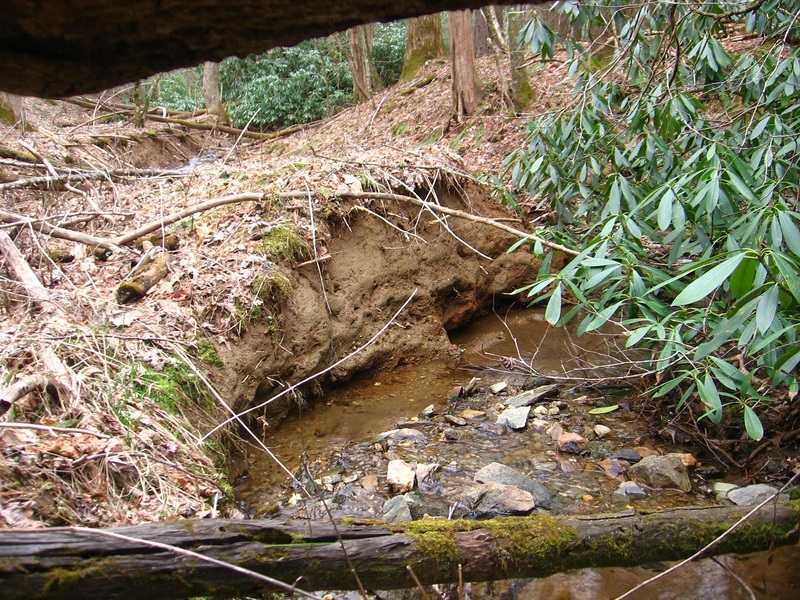 a bridge across two rocks framing the stream with possible avatar activity in the area. Now I can make a direct link between “avatars” and “fairies” through this other Little Whitehead on Monhegan I. To scale, a direct overlap of the 2 Little Whiteheads in question. * Frank Park is the exclusive carrier of the Monhegan-Little Whitehead portal. * Monhegan Island width corresponds to mouth of Norris Brook to mouth of Whitehead Brook, with Woods of Howl between. This is red and blue. Conjunction of Headsville with Bald Prarie in Robertson County, Texas indicates “bald head”. Nearby is White Creek and Heads Creek, just over line to north in Limestone County, but name conj. on map originally made me think this was a White Heads Creek. White Rock is below Headsville. I believe it relates to the first 2 rocks of the above, recent blog post here. The first picture is of a rock with a bald spot upon it. I think I’ll call this Head Rock now. Headville? The next picture is of a white rock, which I’ll call White Rock, which is near Headsville (and Bald Prarie) in Robertson County, Texas. These rocks of course come from the Whitehead Crossing region. There is no article in the Texas Alamac for White Rock, Robertson County, unlike for nearby Headsville and Bald Prarie. However, this comprehensive almanac has a listing for a White Rock in Fannin County, which happens to be near a Petty according to the below stats, as White Rock in Robertson County is very near a Petteway (Pett—y + ewa in effect). White Rock population places in Texas. Notice that White Rock, Robertson County is on a Petteway topo map and White Rock, Fannin County is on a Petty map. This clued me in to their possible association. Originally *here*, in this Maine location, I thought Whites Head (reverse of “White Heads”, Texas just discussed) was actually *one* word, Whiteshead, only corrected in my mind when I just checked in the GNIS database. There is a causeway of sorts, it seems, between this Whites Head, then, and Nautilus Island, which has come to symbolize Second Life’s Nautilus Island and probably Second Life itself. 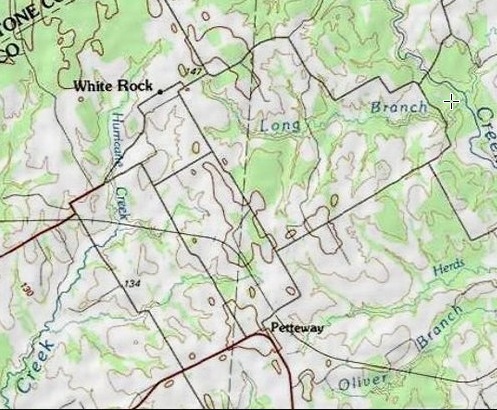 But getting back to the White Rocks of Texas, I noticed that the above mentioned White Rock near Petty is actually not in Fannin County but just over the east line in neighboring Lamar, about a mile and a 1/2 from Fannin County. So the GNIS database got this wrong, harkening back to the Herbert error discussed several months ago on this blog. 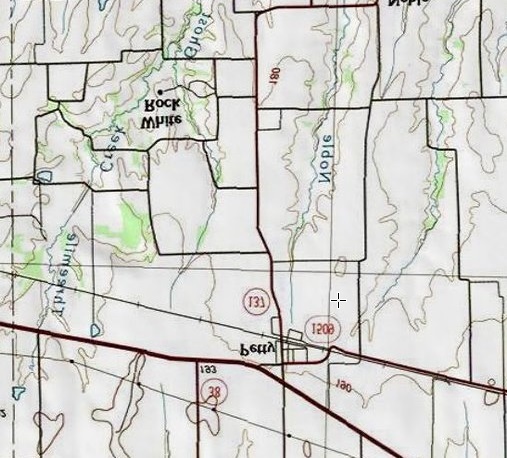 But then in looking at that listing again, it’s interesting to note that a White Rock lies on a Whitewright topo map, and this particular White Rock is just beyond the *west* Fannin County line, in Grayson County in this case, about 4-5 miles in. 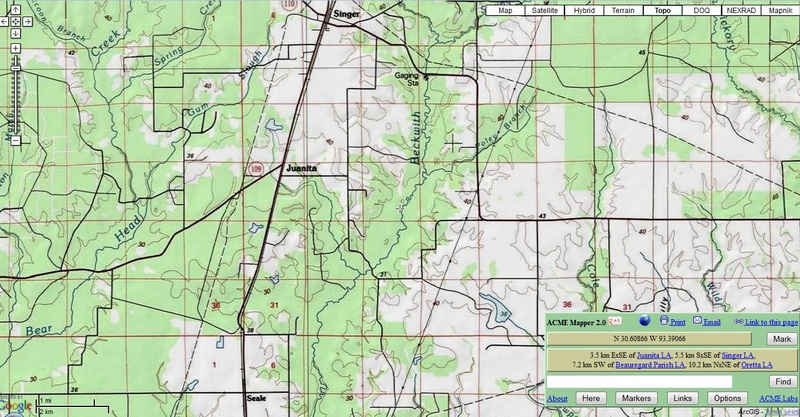 Besides Whitewright we also have a White Mound near this White Rock, making a type of White Rock – Whitewright – White Mound triangle, with two more interestingly named population places within this established triangle, or Tom Bean and Kentucky Town. 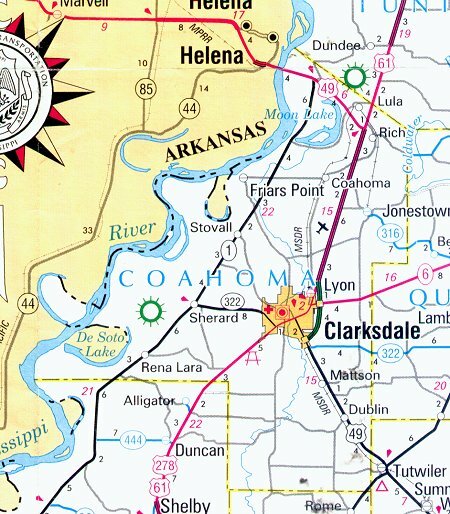 Another perhaps odd thing here: White Rock in Lamar County, unlike the great majority of population places on the topo map involved, is marked with a black dot. So is White Rock in Robertson County. If we make White Rock, Lamar County the retrograde inversion of White Rock, Robertson County merging these two black dots, we find that each lies about 2 1/2 miles from their Petty (Lamar County) and Petteway (Robertson County) and in the same direction. Retrograde Inversion of White Rock-Petty, Lamar County. You can kind of make an animation by toggling this with this. There is one other Petty in Texas, in Lynn County on a topo map named New Home. This is also the only other Petty in the US as a whole according to the GNIS database. From this map of part of Lynn County (lower right corner), we can see that Petty is (or was) near a place called Dune. Grassland exists to the east of Dune in this county still. The planet Dune became the New Home of Paul Atreides in Frank Herbert’s famous novel Dune, already discussed in connection with another map anomaly involving the name Hebert itself. Should White Rock-Petty be fitted into this overall mythology, still developing then? Or is this, ahem, a petty matter to contemplate. White Rock in Whitehead Crossing *points*. What is it indicating, if anything? Now let’s put into play White County, Tennessee, which historically has a Heads (multiple) to the west and a Foot (singular) to the east. There’s also a Heads-Foote in Washington C., MS but let’s not go there right now. Maybe later. Richard Lee Petty (born July 2, 1937) is a former NASCAR driver who raced in the Strictly Stock/Grand National Era and the NASCAR Winston Cup Series. “The King”, as he is nicknamed, is most well known for winning the NASCAR Championship seven times (Dale Earnhardt is the only other driver to accomplish this feat), winning a record 200 races during his career, winning the Daytona 500 a record seven times, and winning a record 27 races (ten of them consecutively) in the 1967 season alone. He was cast as “The King” in Pixar’s 2006 animated film Cars as his 1970 Plymouth Superbird with the number “43”, with his wife Lynda Petty appearing as “Mrs. The King” (a Chrysler Town and Country). We know that Heads to Foote is Addie. Coffin. Death. Heading to ___ for burial but actually for a selfish purpose… purposes. You cannot go there, however. Lisa the V. knows this also. Marty told her. She has to choose the book with the red cover, which means not stop but go. After several attempts at this, I’m finally energetic enough after work to take some worthwhile photos of Whitehead Crossing, which has more and more become a woodsy center or focus for me recently. 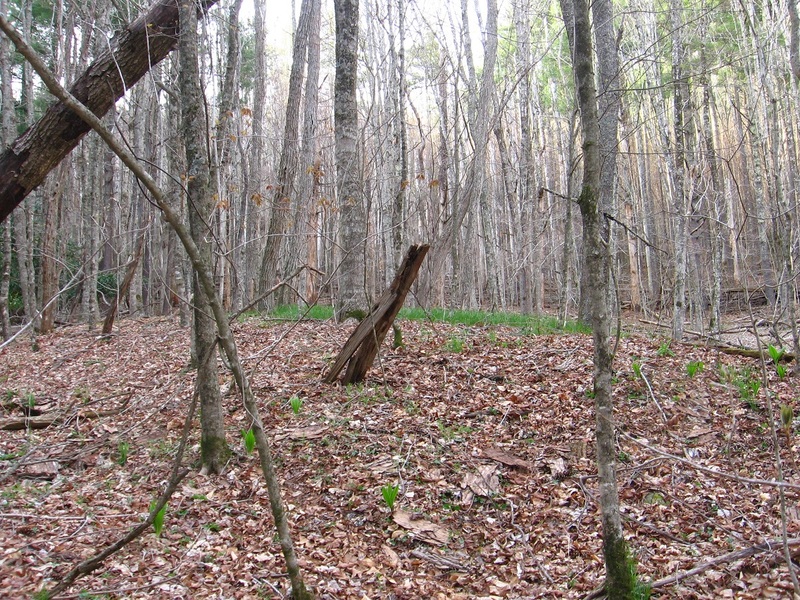 And, I feel, down the road as well, when I’ll be a true White Head in da Woods (retired). How far to go within or penetrate the essence currently? Apparently quite a lot. 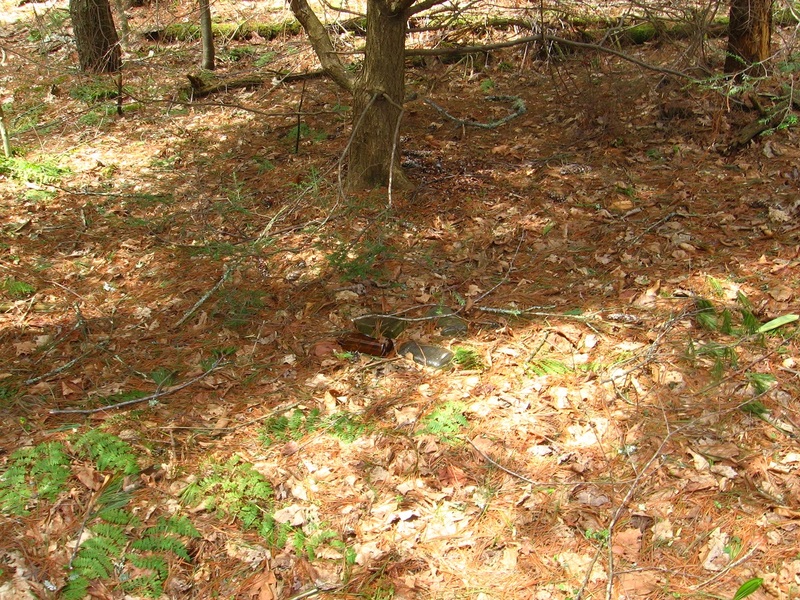 Let’s start with a northeast corner of the designated area, which is the same as the corner of what was probably an old pasture. 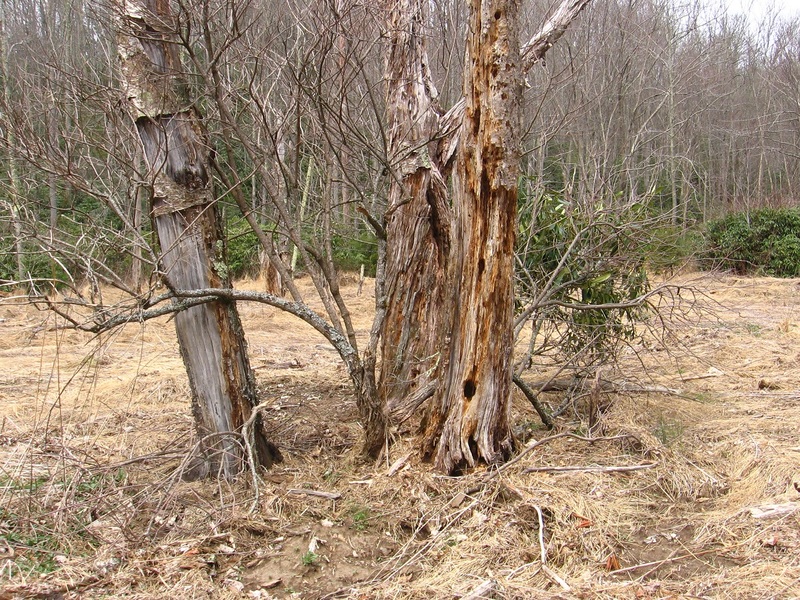 How old are the trees of Whitehead X-ing within this old pasture area? Unsure. 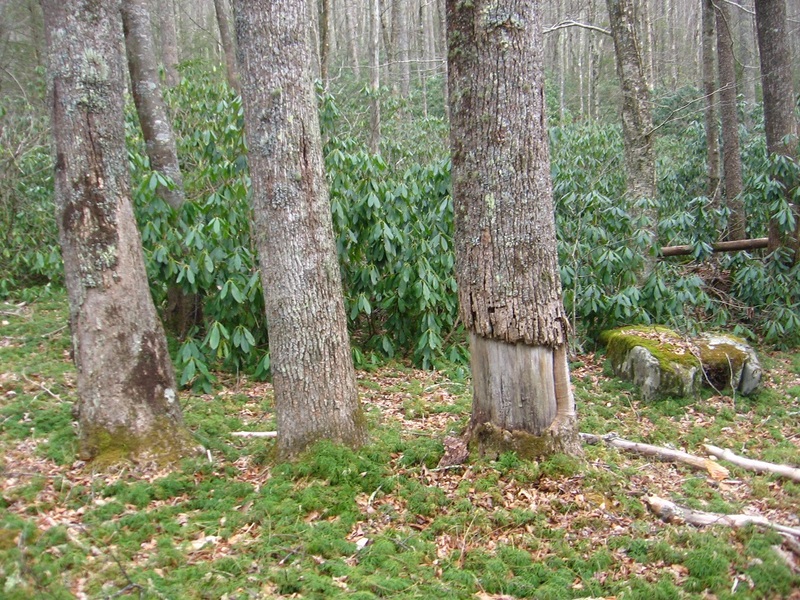 Rotted group of trees just inside this corner. Not sure what kind they are. More trailing vines just down the hill. 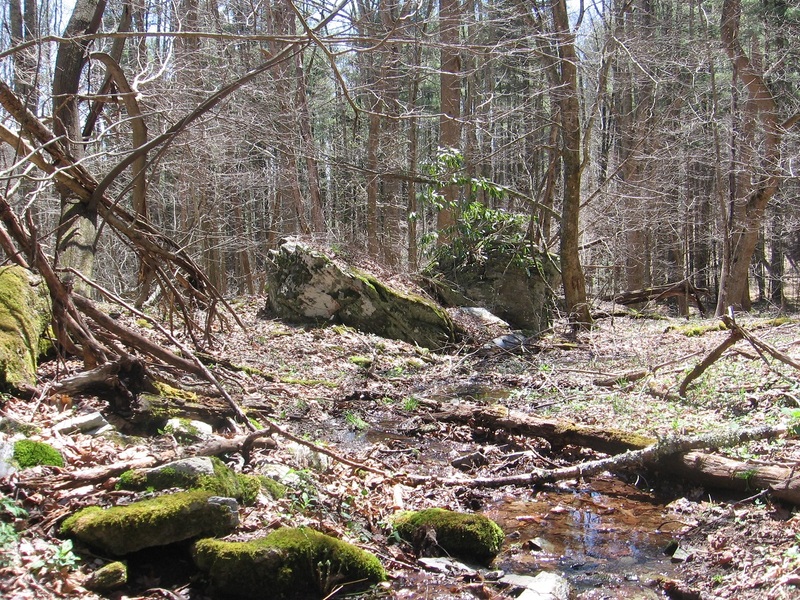 We’re nearing Grey Rock and its accompanying stream once more. Floating tree branch perhaps defining another internal Whitehead Crossing border. Grey Rock from the south. Bottom of Grey Rock’s west side. All these details seem important. Gray Rock, of course, has a famous topping rock, as yet unnamed actually. Piggyback Rock? It’s the original one thing on top of another thing according to more of that local legend. So that makes it also the Original Collage, I suppose. More on this rock soon. It’s obviously a center of a center. 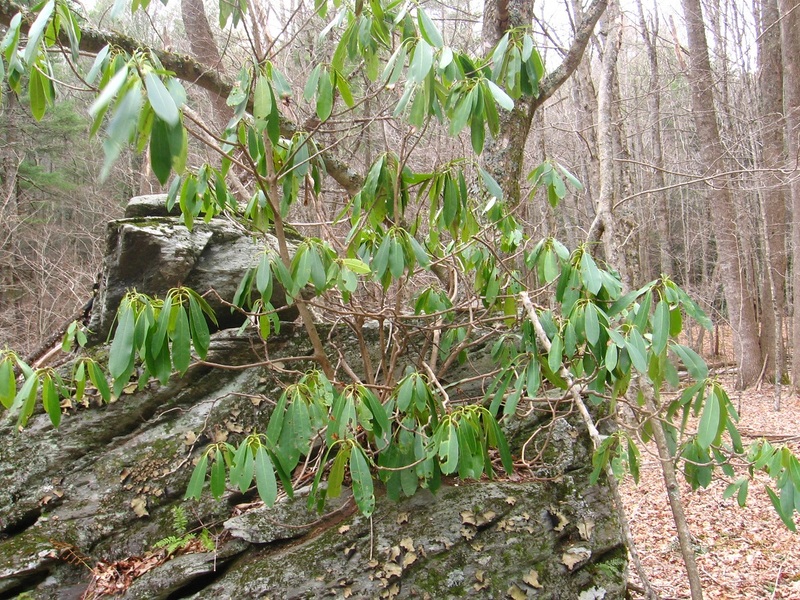 A rhododendron sprouts from the side of Gray Rock, attempting to hide its topping or piggyback rock from this angle. East side of Grey Rock. 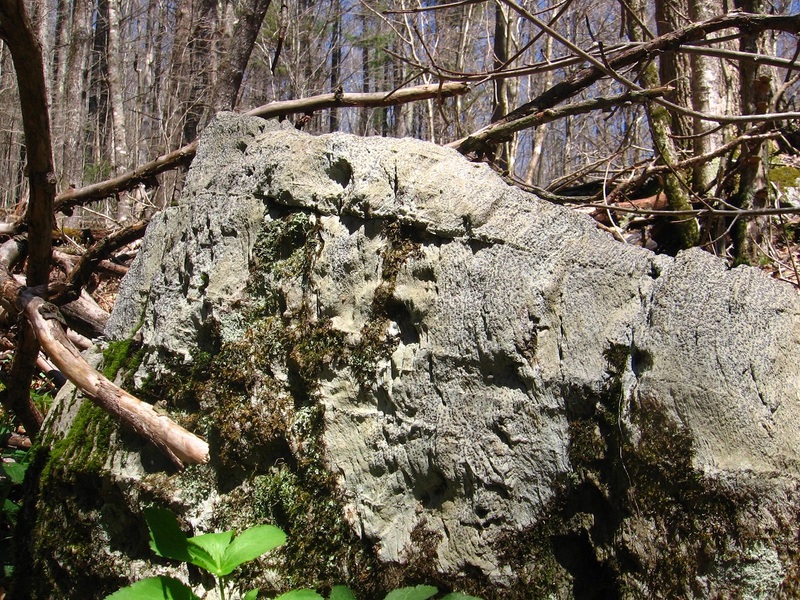 Remember that this rock had been associated with Maine and Norumbega and Nautilus Island/Jeogeot/Second Life well before I learned about the additional strong Maine resonance with the area through Monhegan Island and its Whitehead and Little Whitehead, etc. This connected to the fact that Grey Rock is also known as Jeogeorock (or a jeogeorock, for there may be several), or a rock that embodies the essence of Second Life’s Jeogeot continent which I was so involved in for several years. 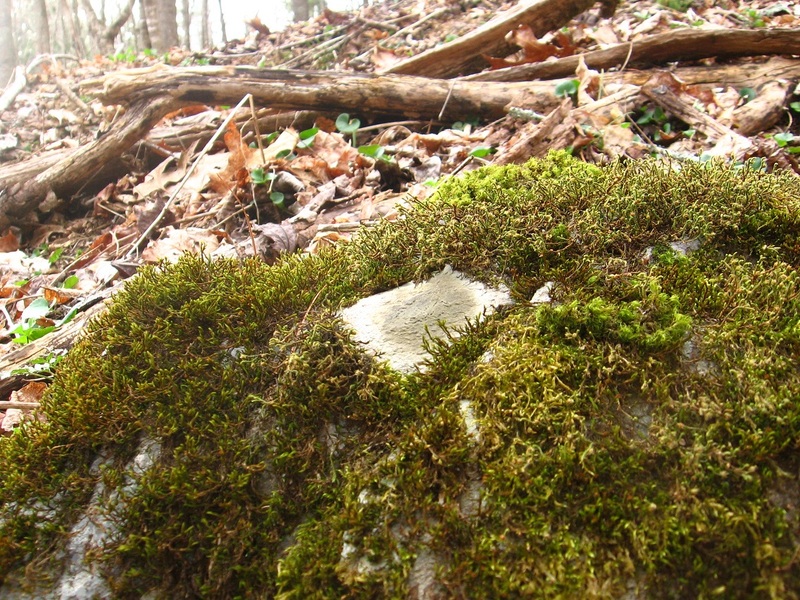 Closeup of recently designated White Rock next to the second largest rock of the Grey Rock complex. Where *does* it point to? Grey Rock and largest neighbor, still unnamed. White Rock is on the other side of the foreground rock. 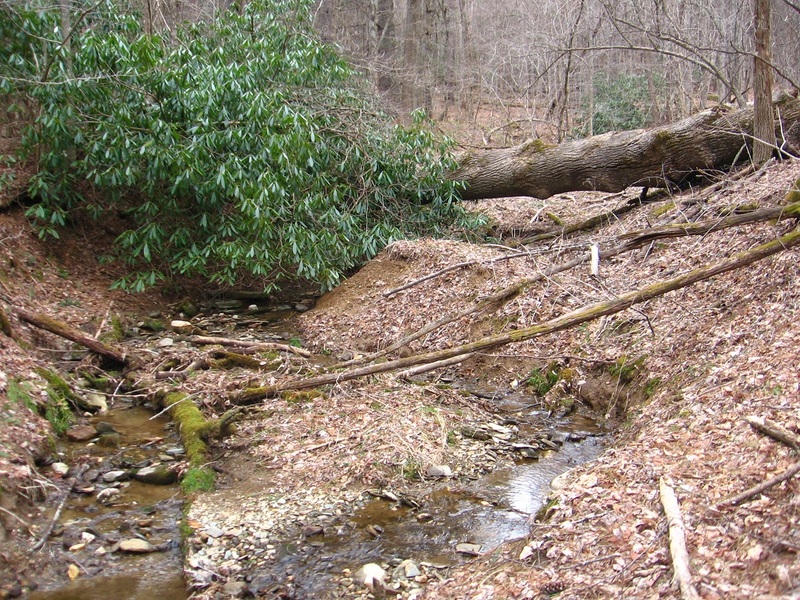 The stream flow beside Grey Rock. I must get a name for this soon. 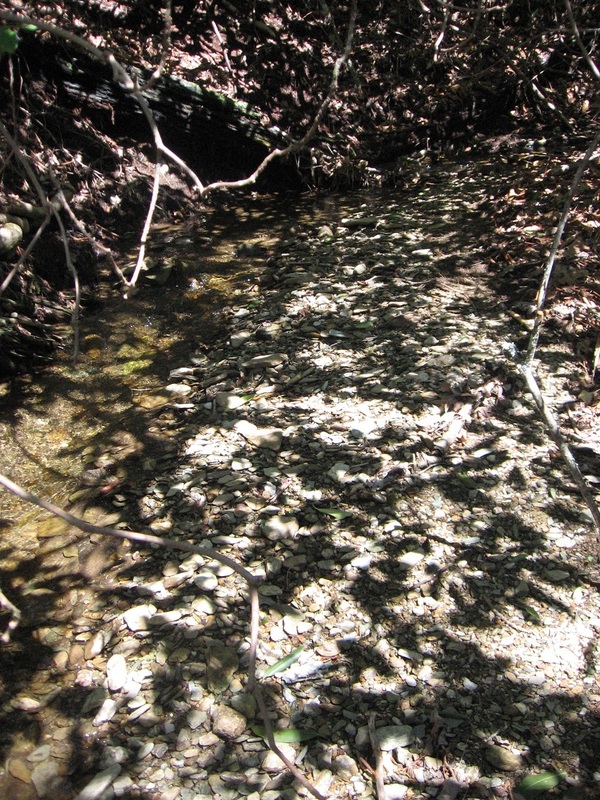 This is obviously not Little Whitehead, an appellation which has been claimed by the only other spring flow within Whitehead Crossing, just to its west. We’ll get into more of that in a moment. To the right in the below photo you have Bald Head Rock, which, like White Rock, has direct associations with Robertson County of the Lone Star state. Was Grey Rock known at one time as King Rock? Or was its *neighboring* large rock known as that? At any rate, if you enlarge the below photo by clicking on it, you can see White Rock as a white speck against the latter’s gray surface. I also see the spot where I took the photo here as a place of meditation in the future, perhaps the site of a temple even. 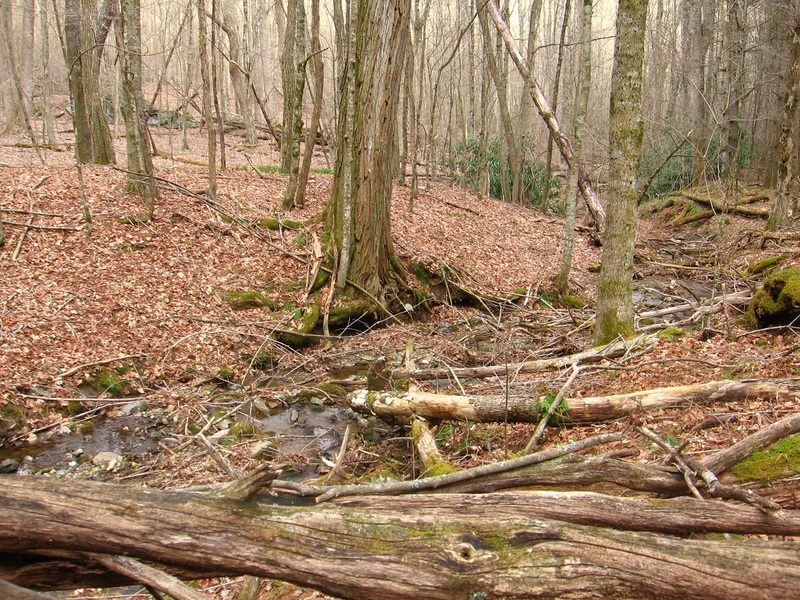 It lies at the head of the spring, with a great view down to Grey Rock and also the woods beyond. Each of these rocks could have a story to tell. 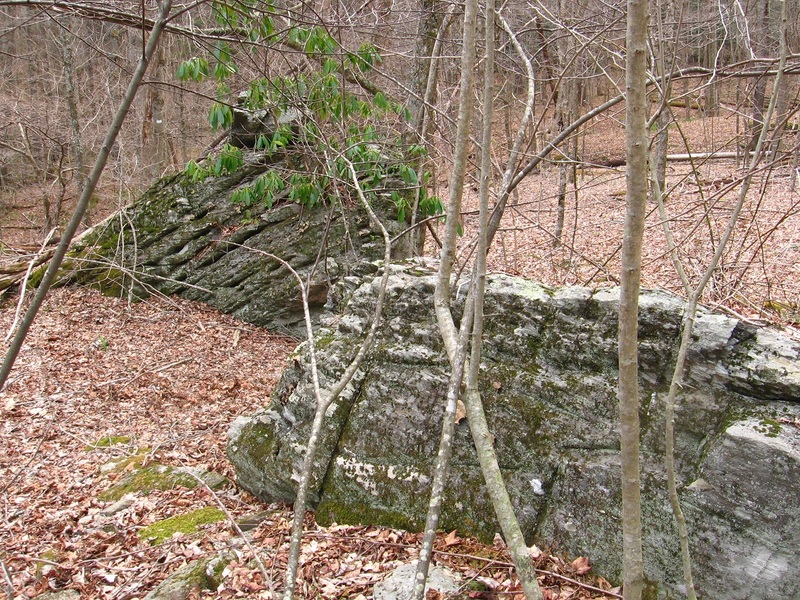 Picture of the middle rocks of the stream, taken from the west. None of these rocks currently have names. 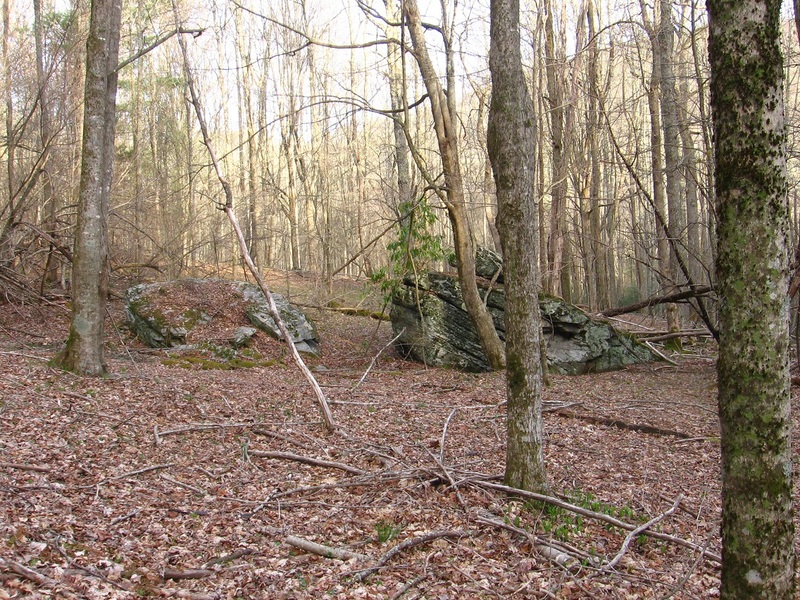 It could be that one of the rocks around Grey Rock is called Seale or Seale Rock, thinking of yet another Robertson County town near Headsville and Bald Prarie. We’ll just see. * If so, it might be a Seal Stone, shortened over time to Sealston. Closeup of Bald Head Rock. A smooth rock below Grey Rock, with my now empty coffee cup atop it. Seale Rock in the distance (yes, I’ve already figured out which one it probably is!). Grey Rock and topping Seale Rock (!) from the south. 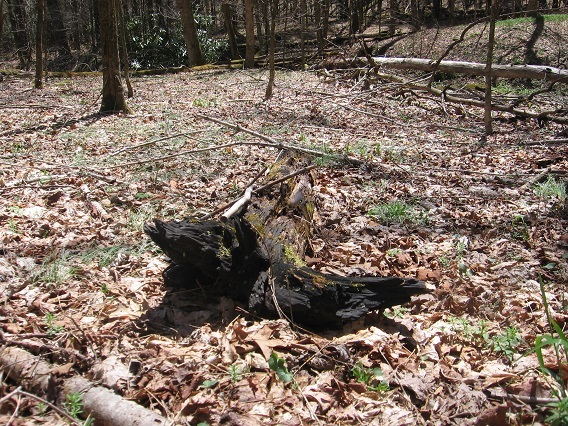 This end of a tree trunk stuck in the ground probably means something as well in meaning packed Whitehead X-ing. We now move to the top of Little Whitehead only maybe 20 or so yards to the west of Grey Rock. 3 pine trees traditionally marking another boundary of Whitehead X-ing, this time on its west side, and just above the source of Little Whitehead. 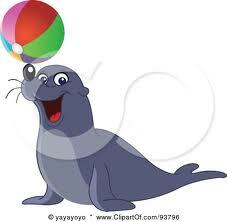 * Elton John’s “Grey Seal”. ** Jethro Tull’s “Sea Lion”. Ridge between Little Whitehead and Whitehead (Brook). This may be the site of the true or at least the core of Whitehead Crossing. Makes sense. There’s that evergreen grass again, back center. 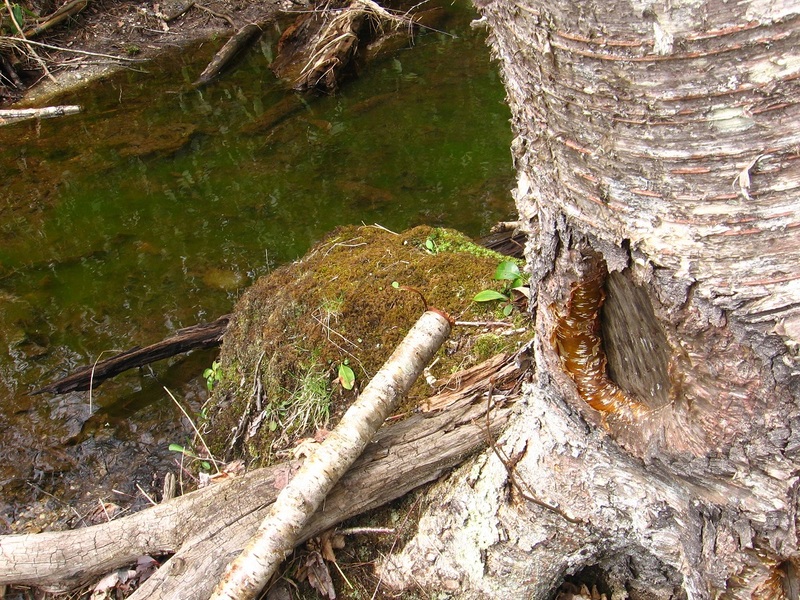 Red root in Whitehead Brook. Very large tree beside Whitehead Brook on this ridge. I believe this is a locust tree. 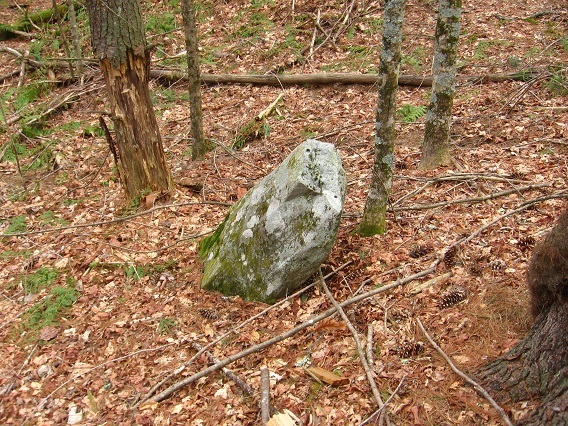 Directional Rock, to south of Whitehead Brook now. 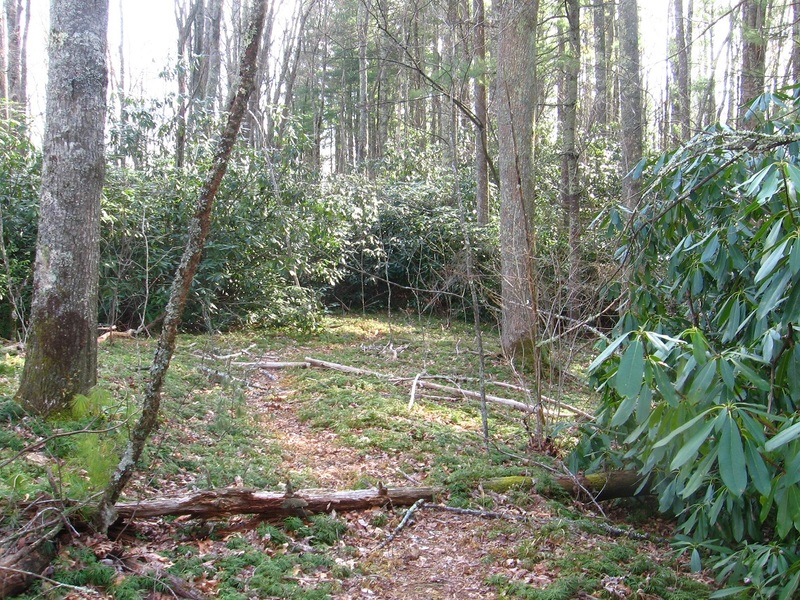 This lies between Hucka D.’s bottle site and Rock’s Meadows. And now Hucka D.’s 50 or so bottles. 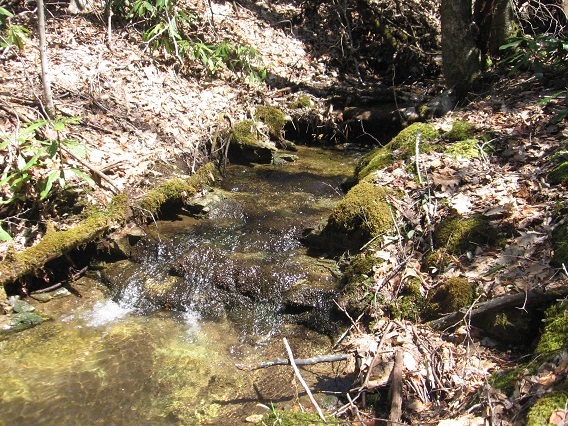 … and then the spring which lies beside the Grey Rock complex, which presently doesn’t have enough water to make it to Whitehead Brook — dries up in the meantime — but obviously during heavy rains does. It just so happens that this huge tree (oak?) fell across Whitehead Brook right at this conjunction. Dry patch underneath this fallen trunk. Higher clay bank just beyond (downstream) — no name yet. 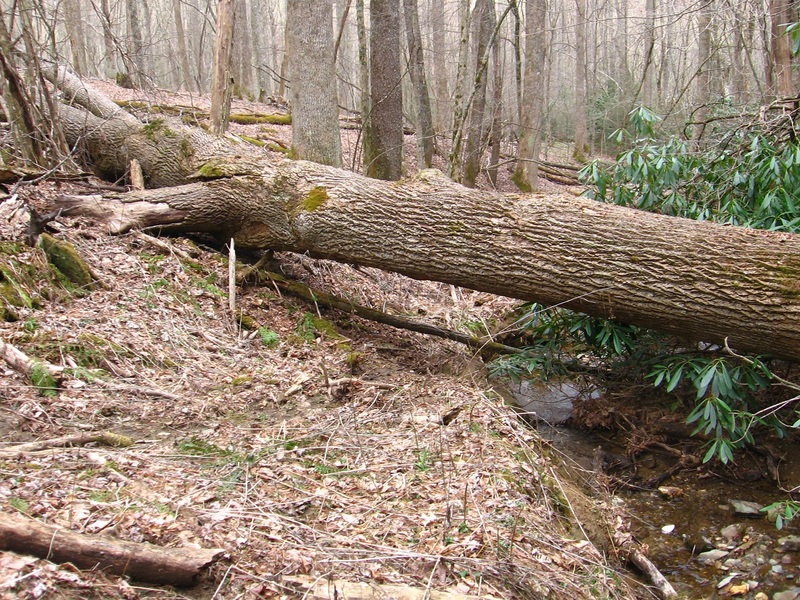 Log from downstream. The island in the foreground also has no name as of now. I’ll create a new Whitehead Crossing map showing these new Whitehead Brook & Whitehead Crossing divisions asap. 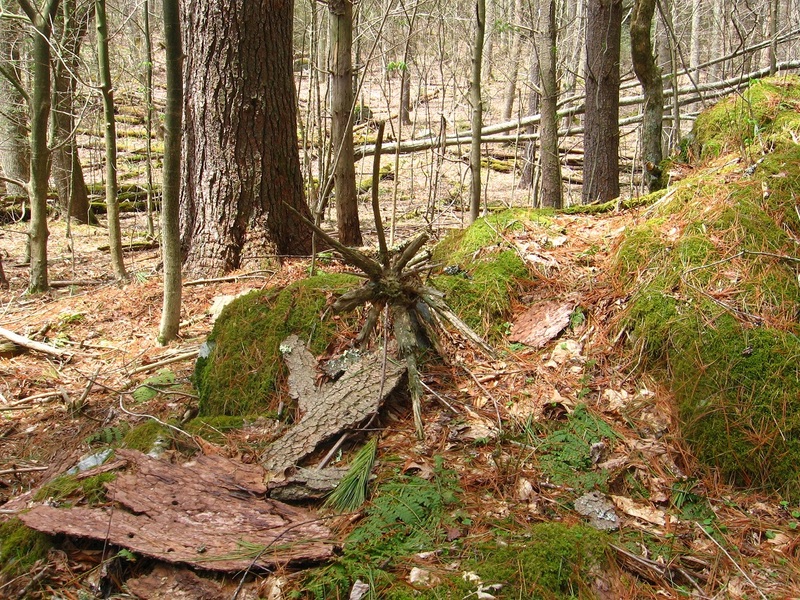 So here we have the *legitimate* fairy house, i.e., the one not built by human hands. I’ll attempt to take a close up shot asap. 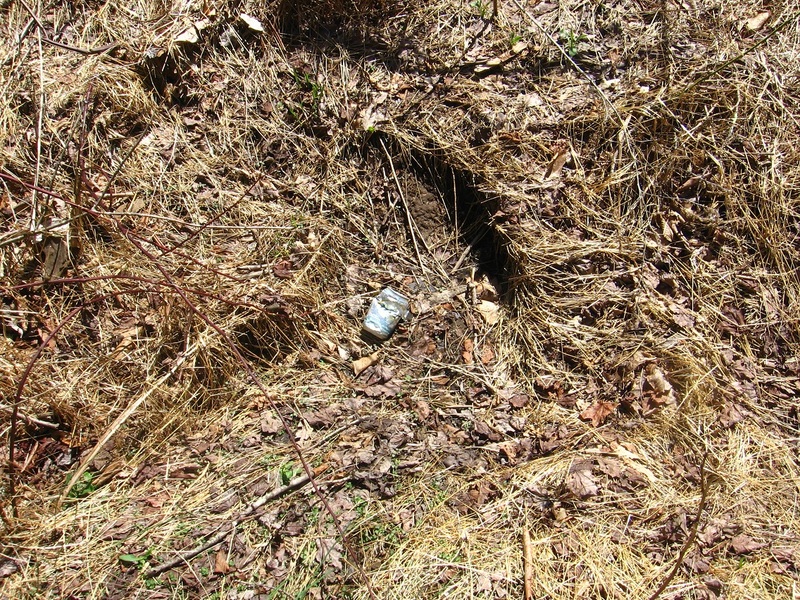 Legend goes (or will go) that perhaps the only true fairy of Monhegan Island discovered a portal (created?) around Little Whitehead on *that island*, connecting it to the Little Whitehead of my woods here in Frank Park. 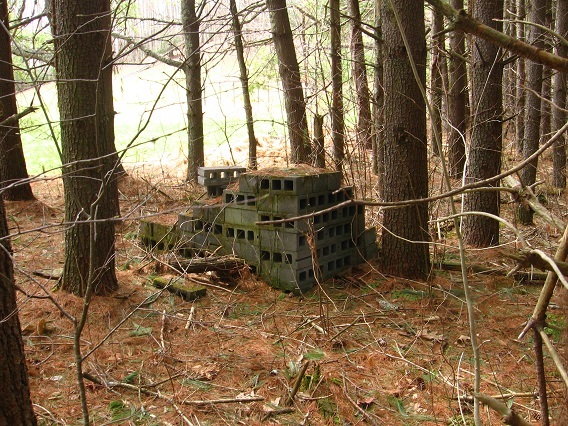 Perhaps he tired of the tourists on the Maine Island, and their feeble attempts at creating actual fairy houses. He tired of their unending attempts at capturing the true nature of his island through oil paintings and watercolors. He tired of the ones who wanted to be the new Wythes, yes. So he came here or escaped here, a quieter place but of comparable beauty and of larger scope. Is this the same as Rock Meadows, also of Whitehead fame and whose rocket ship supposedly crashed not far atall from the recently discovered fairy house there? I’m not sure. And what of the 3 tulip trees in front of the fairy house here? Planted by the fairy himself? If this isn’t Rock, then what’s his or her name? Are there more than one? Is this a fairy *vacation* house of sorts?? 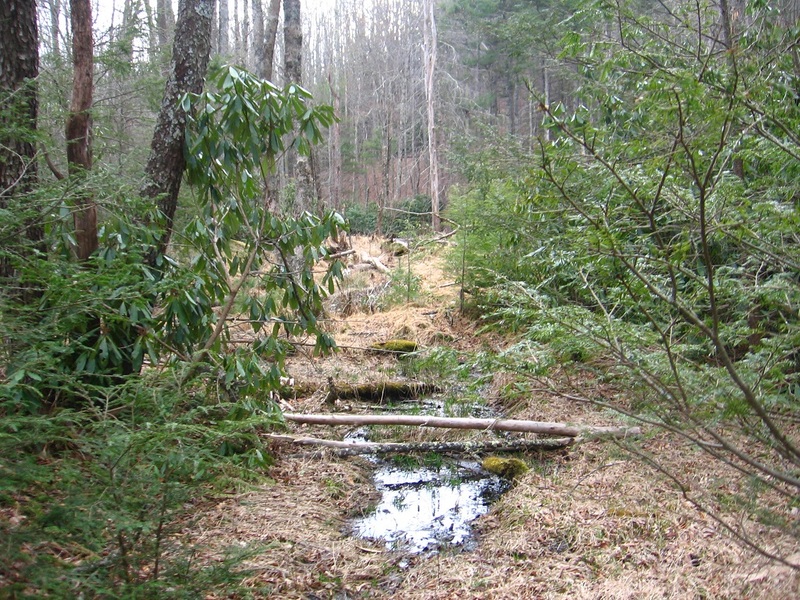 Stream in front of the fairy house and meadow, leading straight towards Green Stream and also Rock’s crash site. 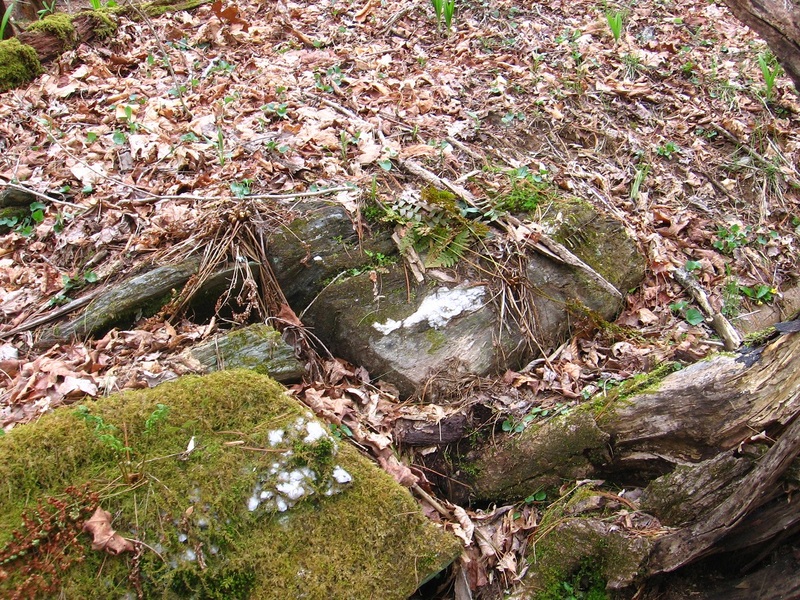 There must be a relation between Rock and this fairy house. The community was founded in 1888 and grew up around a ranch owned by Enos Seeds and his brother, Thomas. From the 1940s through the 1970s the population was recorded as 200. It had dropped to sixty-one by 1980. In 1974 Grassland still had two cotton gins, a store, and a station. The population was still sixty-one in 1990. The population remained the same in 2000. It’s also Lynn County’s oldest community according to that same Texas Online Almanac article. Herbert began researching Dune in 1959 and was able to devote himself wholeheartedly to his writing career because his wife returned to work full-time as an advertising writer for department stores, becoming the breadwinner during the 1960s. He later told Willis E. McNeilly that the novel originated when he was supposed to do a magazine article on sand dunes in the Oregon Dunes near Florence, Oregon. He became too involved and ended up with far more raw material than needed for an article. The article was never written, but instead planted the seed that led to Dune. Eye features the startlingly original collaboration “The Road to Dune,” a walking tour of Arakeen narrated by Frank Herbert and illustrated by acclaimed British artist Jim Burns. Also included is an introduction by Herbert describing his personal feelings about the filming of David Lynch’s movie version of Dune; Herbert’s own favorite short story, “Seed Stock”; and tales from throughout his career, some never before collected. As suggested in the discussion of Children of Dune, Herbert seems to subscribe to a kind of evolutionary ethic, which uses survival as a touchstone for evaluating species behavior. This ethic is also the subject of one of his most effective short stories, “Seed Stock” (1970). In 4orrin1, the 601 here is directly overlapped with the number 61 of Giant Rat of Sumatra (36:39). 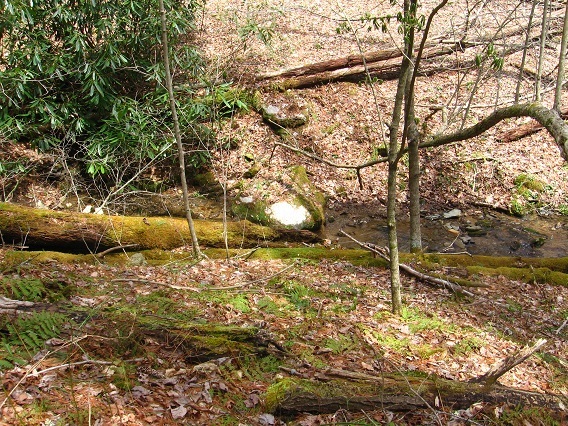 We start at Concreek for this particular post: Mossy Falls. I’ve begun to walk Concreek again after basically ignoring it since last summer. The water flow pattern is quite different now. A beach has formed in The Dark that I don’t remember being there. 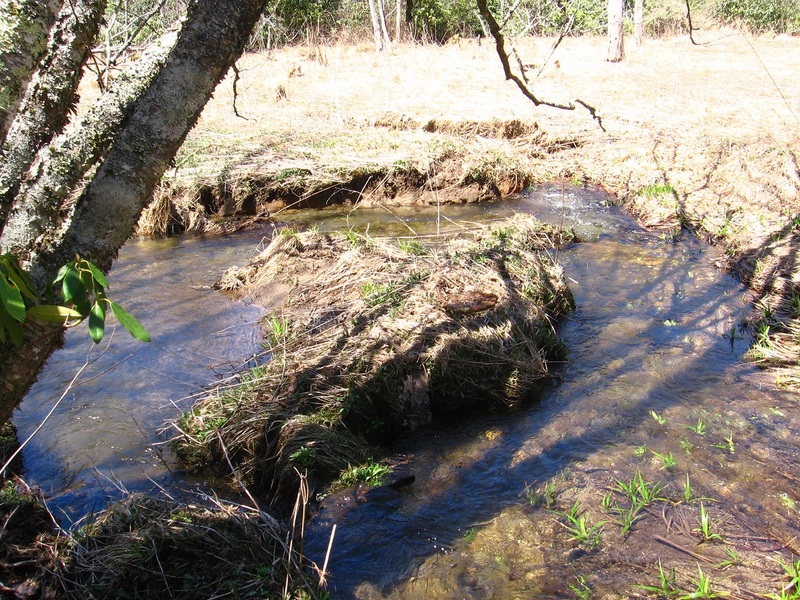 I’ll have to check old Concreek photos soon (perhaps today!). Dry Falls (The Open): no longer dry. We’ll see how long Concreek goes with the flow this year. Last year I believe it was dry at this point by about June. But we’ve had a lot more snow and ice this year to build up the ground water. Very curious to compare. A quite interesting irregularly shaped red rock in the middle of that beach pictured above. I’m tempted to call it the Red Herring, but actually it looks more like a pork chop. 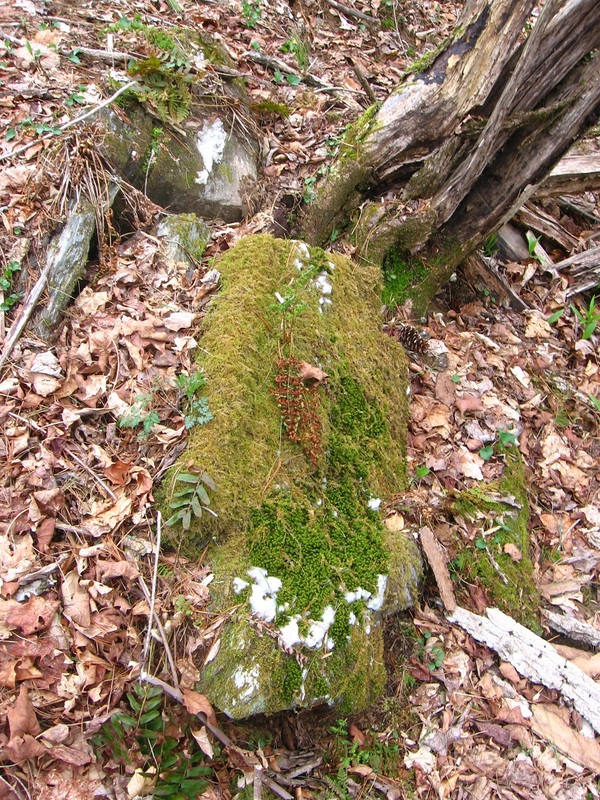 Nice contrast between its rough red texture and the recently sprouted, smooth and mottled green growth next to it. … like The Land of Purple and Blue. Here’s one of the first indicator that we’ve moved into a different space independent from Concreek: a blue soda can. This would be about 100 yards above Damsel Island, perhaps. 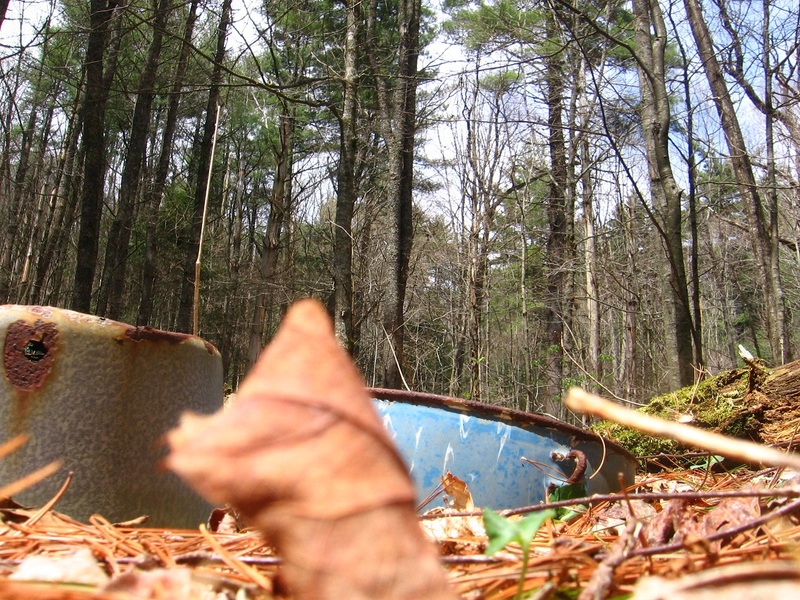 A shot of the old blue can (foreground) with a log bridge in the background (not the arched one, but the straight one just below it) that’s been dubbed The Bridge of Blue and Purple. Appropriately we have this blue can on one side of it, and about the same distance on the other side (closer to Damsel Island and Concreek), a purple soda can. I’ll have to go back (perhaps today!) and take a closer look at these equidistant containers. The Land of Blue and Purple, as I’m currently interpreting it, is technically entered by re-crossing Green Stream via the log bridge mentioned above (equidistant between the blue and purple cans, once more). 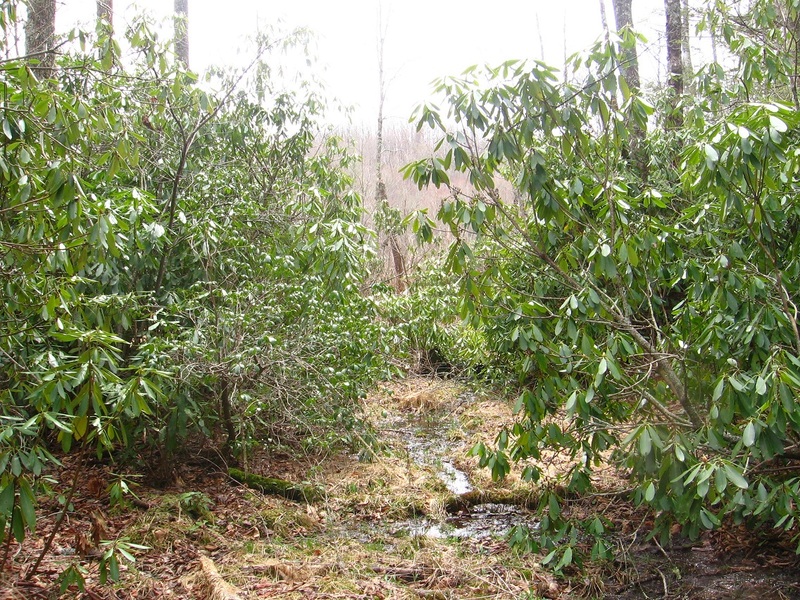 A clear area in the mainly rhododendron clogged region marks the location; all you have to do is cross the bridge and walk uphill a bit to reach it. But in truth the Land of Blue and Purple seems more a red herring, for the actual focus of this bridge appears to be The Totem, followed from the opposite direction. Appropriately I may call the capital of the Land of Blue and Purple Red Herring, and even mark it with that red rock I found in Concreek this same day of picture snapping. But let’s move to the area of The Totem, a quite mysterious object indeed. But it was only on the following day of exploring, where I descended Concreek once more, that I found the actual totem. 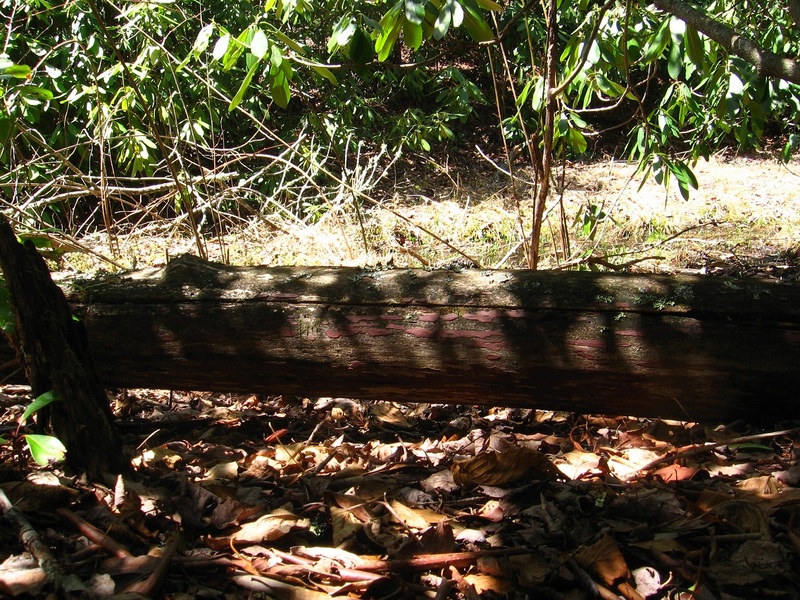 This day I discovered the purple fungus on a log just beside it, attracted to a flat clearing underneath rhododendron branches between 2 stream flows opposite Green Stream in the open area there. This probably has something to do with the Land of Blue and Purple don’t you think? I’ve recently discovered this same kind of fungus, apparently, in Whitehead Crossing, but there it took more of a red or maroon cast. 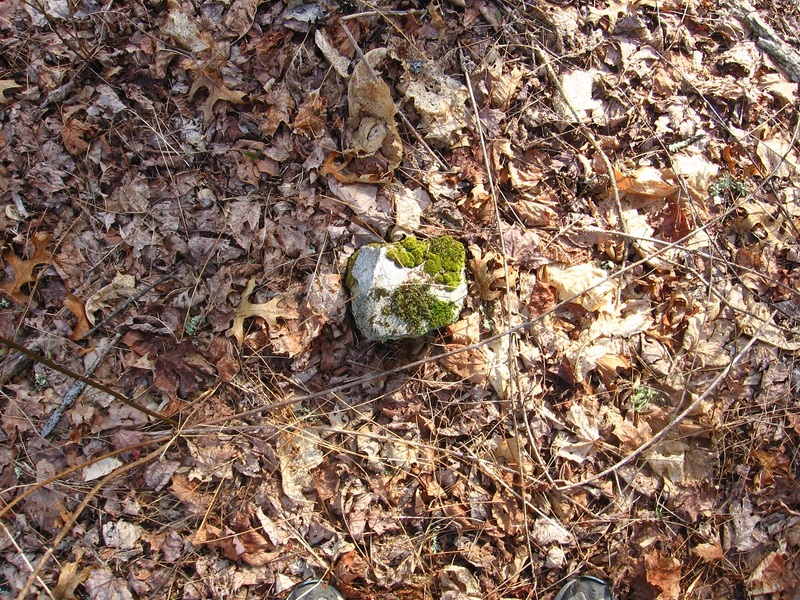 Nearby is this rock that I think could have been placed here on purpose — not natural, as it were. The rock will probably garner a name soon. It lies near the head of the smaller of two water flows in this area, as yet unnamed as well — let’s call it Silverberg for now, partly because The Totem reflects a silvery hue. * If this place truly is named Silverberg, or was in the past (future? ), then Monkey City may also be involved. See: Head Trip. Hemlock tree hiding The Totem from the direction of Bridge of B and P.
I actually returned to the Land of Blue and Purple yesterday, the day after these pictures were taken, but didn’t snap any more shots. I have a new name for the area: Silverberg, which is connected to both the Korean Channel and Pork Chop Hill. * But I think Silverberg at least has closed up early for me. Saw a snake there yesterday that wasn’t the cute garter variety I’m use to seeing. Not a big snake, but perhaps a young blacksnake or water snake. I’ll leave it/them in peace at any rate until they slink back in their holes when cold weather returns. 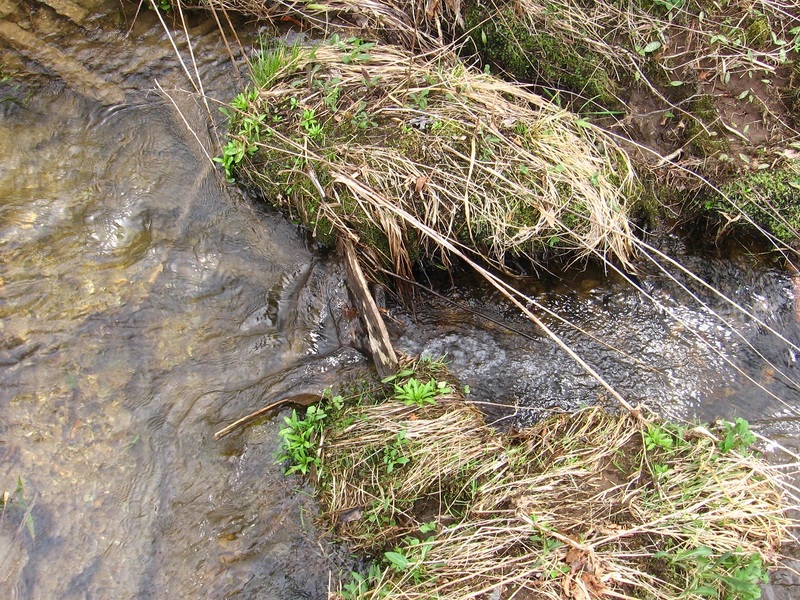 I’ll probably treat the whole, marshy Korean Channel in this manner, except for the very upper part, perhaps, where it connects with Whitehead Crossing. Below we have another shot of The Totem of Silverberg, and perhaps its glinty metallic appearance lent itself to the name of this “burg”. 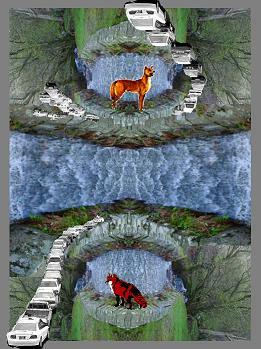 Here The Totem is merged with a background tree, as in a real life collage. There’s one significant pool of water in Silverberg, and this picture is taken from its side. I don’t as yet have a name for this pool, but The Silver Pool could be a candidate. 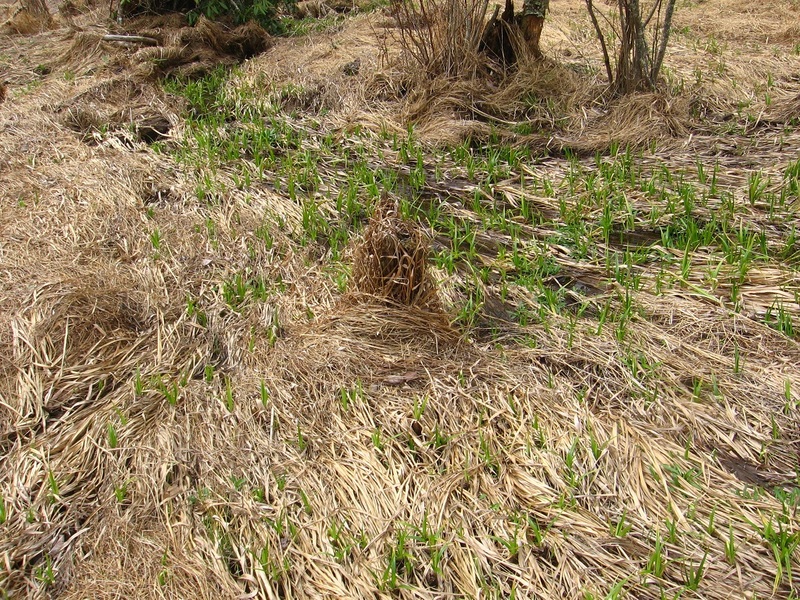 Many frog eggs are currently in this body of water, nestled in a swirling abundance of algae. Perhaps the calm, reflective quality of this pool is the source of the name Silverberg instead? 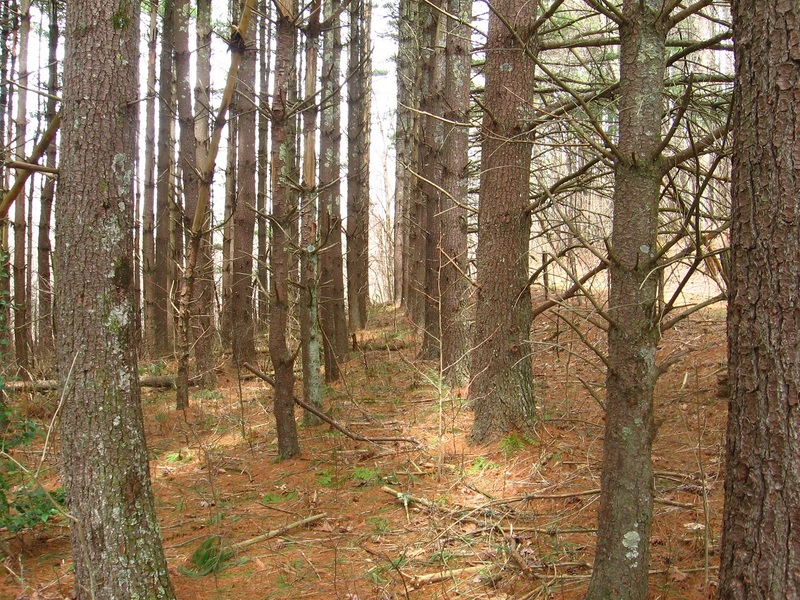 There’s a flat region to the pool’s east that is also most likely a part of Silverberg, dotted with small pine trees like in the photo below. 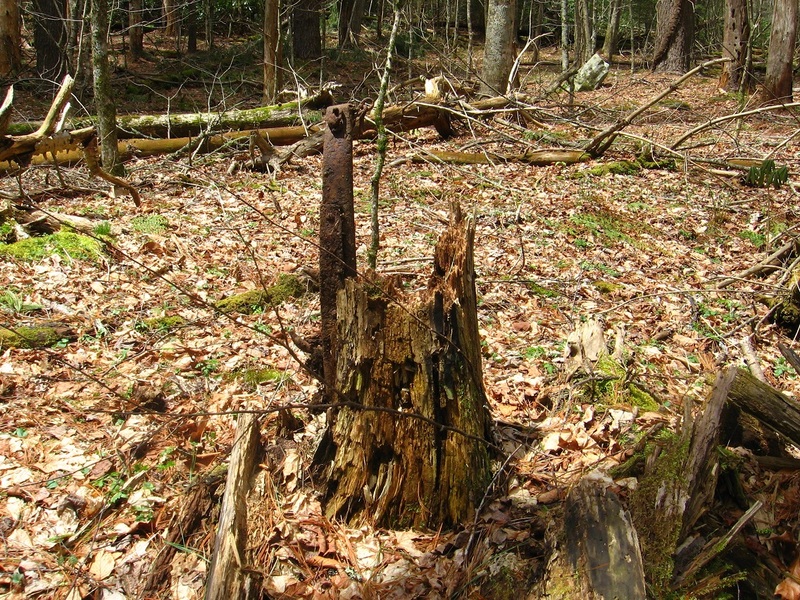 The central stumps seem significant: ruins of an avatar castle? … this being the other one, just to its east. It’s a bit smaller. 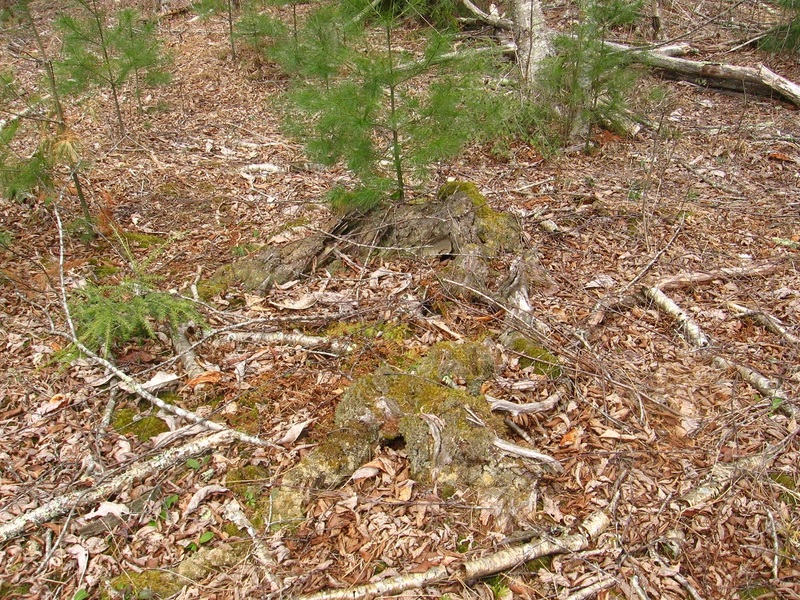 The 2 streams, again, conjunct at The Totem, which would be dead center in the below photo, but hard to detect because it is sihoutted against another, similarly colored tree. This *is* the Korean channel (!) It’s also an audiovisual tile. No Title Spring. Water only in middle of its course presently, evaporating or heading underground before reaching Grey Rock. 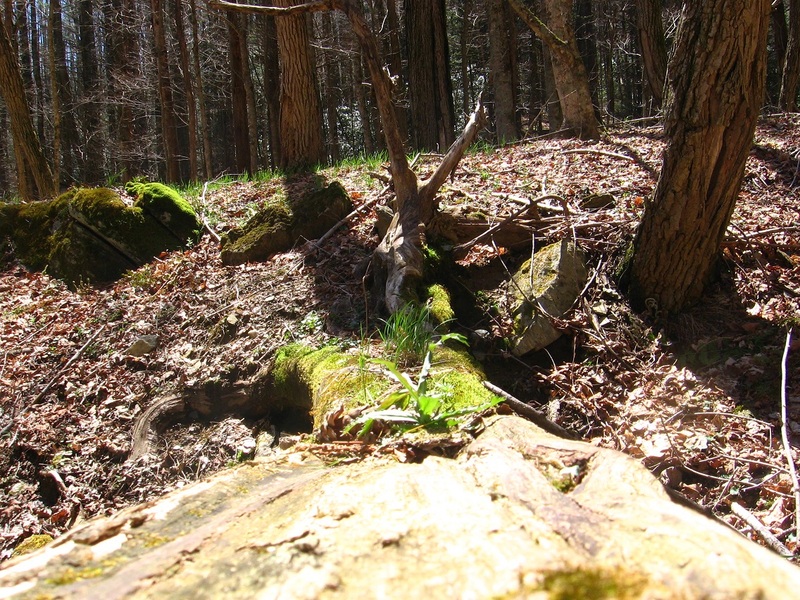 Ground shot of a rock beside No Title Spring. I’ll be taking more of these types of pictures, especially at Whitehead Crossing. Another rock from about the same location. Like the spring, there’s no names for these rocks yet — but actually the spring has a name now: No Title Spring, accompaniment to Grey Rock and its piggybacking Seal Stone, it seems. Grey Rock (left) and No Title Rock (right). It’s also possible that No Title Rock is the actual Seal Stone… all this is in development still. Blackened end of an uprooted tree. The Little Whitehead bridge first discussed here a bit. This is a new twist: the mossy colored rock in the background of the picture above certainly appears to take the shape of a green turtle (!). 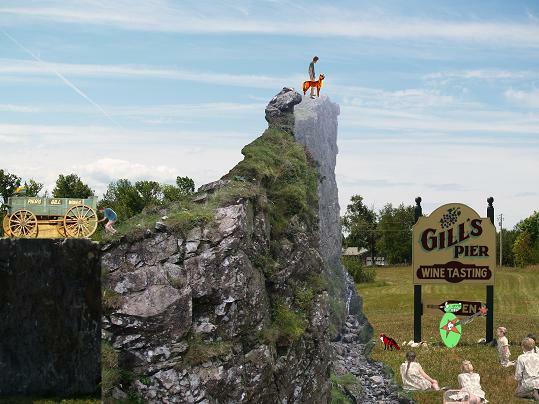 But is it *mounting* the rock? Unnamed Whitehead X-ing rock near 4 Sticks, on the opposite side from Whitehead Brook. “Exploding” end of a branch atop a nearby rock, also unnamed. Interesting shiny spot on a 4 Sticks limb; of unknown nature. 4 Sticks. This is most likely an area originally called ZoSo because of this, perhaps later morphed into SoSo (SEE: Pietmond). 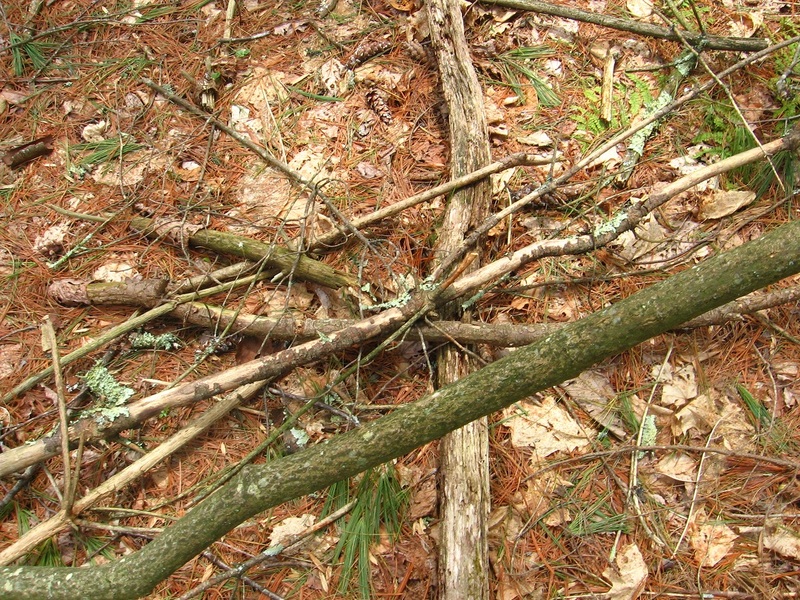 Crisscrossing of sticks in the 4 Sticks area, but not any of the 4 Sticks themselves, which run, instead, parallel to each other in a row. Big Log (name?) disappearing into rhododendron above Whitehead Brook. 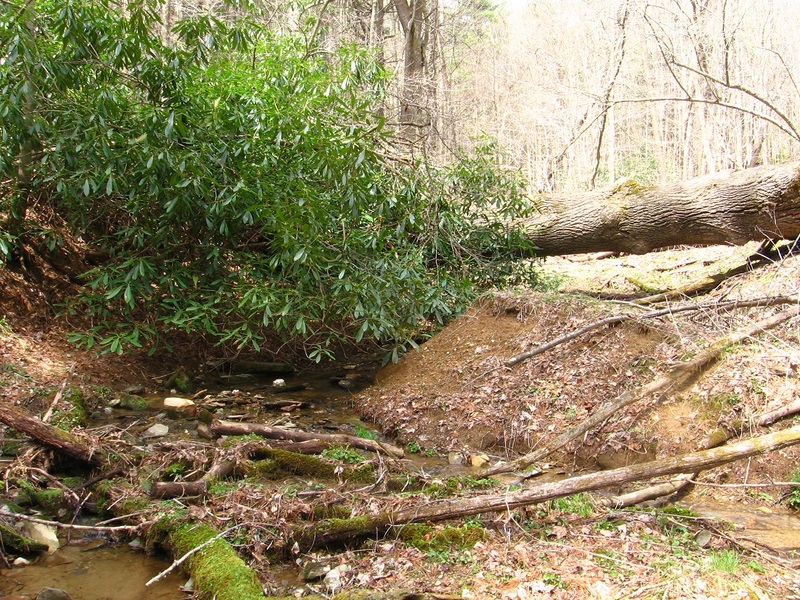 The higher creek bank before it may soon be topped with some kind of avatar “castle” or other structure. Just a vision. Little Whitehead scene with the “green turtle” rock again mentioned at the end of the Whitehead X-ing Again 01 post. But when we shift to the top of the formation, it takes on more the appearance of a green *parrot*. 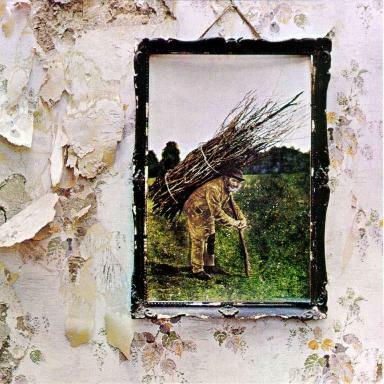 * Compare this to the album cover of Zoso, also known as Led Zeppelin IV. This album was highlighted in Carrcass-3, by the way. Hucka Doobie has since indicated that the hanging branch is a direct reference to this cover (!). The 19th-century rustic oil painting on the front of the album was purchased from an antique shop in Reading, Berkshire by Plant. The painting was then juxtaposed and affixed to the internal, papered wall of the partly demolished suburban house for the photograph to be taken. The album cover was among the ten chosen by the Royal Mail for a set of “Classic Album Cover” postage stamps issued in January 2010. The inside illustration, entitled “The Hermit” and credited to Barrington Colby MOM, was influenced by the design of the card of the same name in the Rider-Waite tarot deck. This character was later portrayed by Page himself in Led Zeppelin’s concert film, The Song Remains the Same (1976). The inner painting is also referred to as View in Half or Varying Light and was sold at auction under that name in 1981. 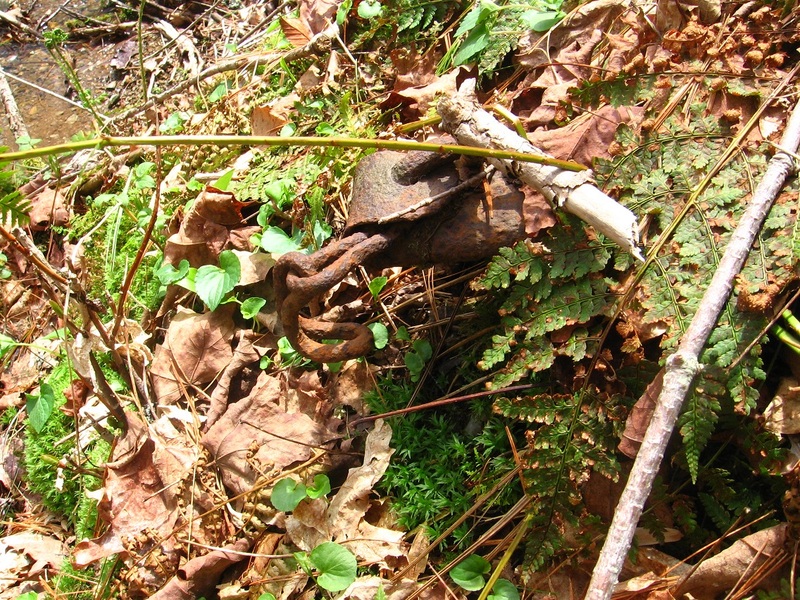 Piece of metal with chain found on bank of Whitehead Brook just beyond what I thought was metal in the stream itself, but turned out to be a long, jagged piece of rust colored bark. Queer conjunction, then. Upon closer examination, the piece of metal extended well back of the chain. This was a rather botched shot of a shinier rock near the conjuction of Whitehead Brook and Little Whitehead. Sneakily impressive albedo in action here. 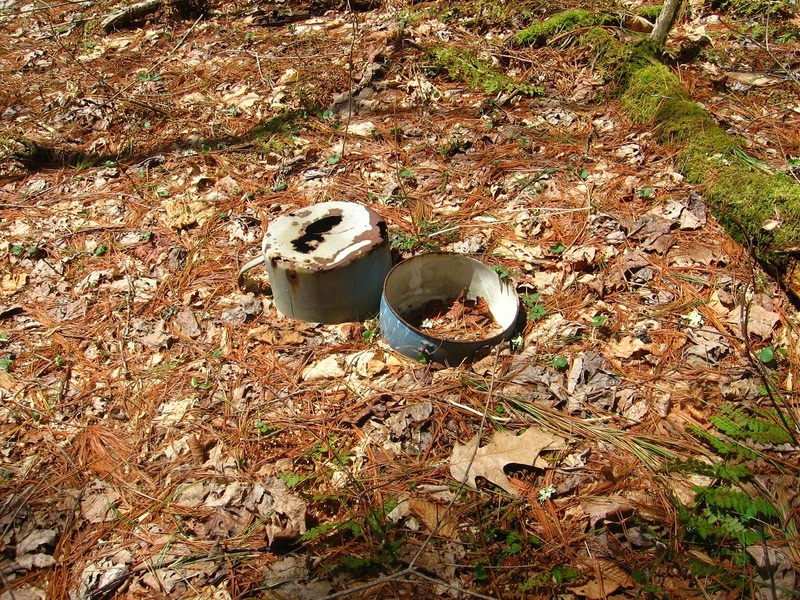 2 pots near the center of Whitehead X-ing. I have not pulled these out of the ground for closer examination yet. My guess is that the bottom is rotted out of both. Nearby group of bottles laid there probably over 2 years ago by yours truly. No art present yet. What appears to be a yellow jacket nest on the ground near the pots and bottles pictured above. Looks like it was knocked out of a tree. Wind… or aliens? 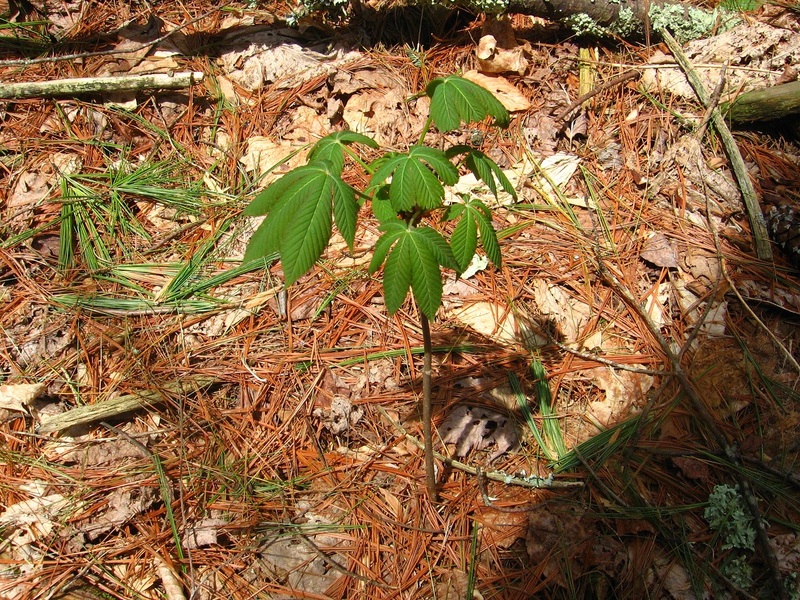 Buckeye saplings are common in this forest. 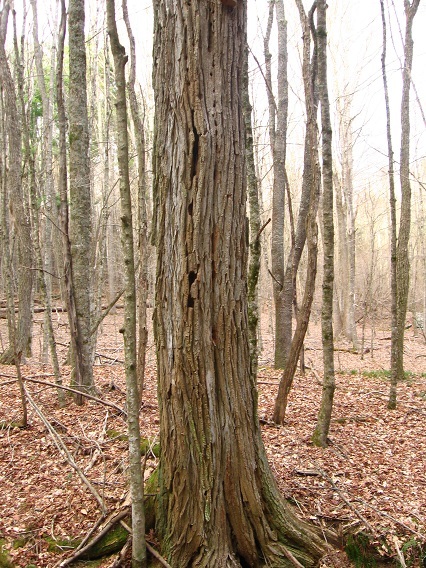 Stick’s End (interesting trunk terminus of the 4th and last stick of “4 Sticks” fame). 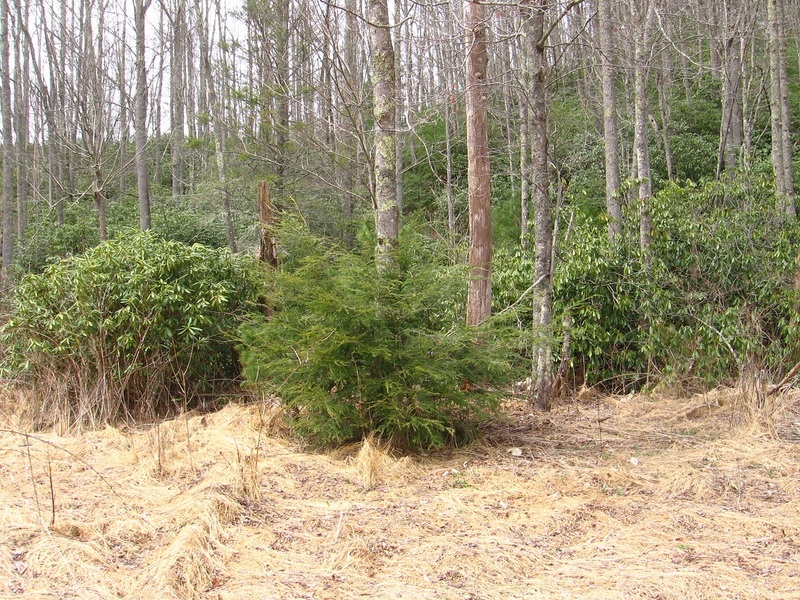 Where: Unsure if I want to start this project on my Maebaelia property, or rent larger property elsewhere. I don’t have in mind right now to buy property from the Lindens. Thinking of maybe larger than 12000 square meters next go around. Why: Virtual towns (like Pietmond) based on geography of virtual worlds in and of itself seems dead. Virtual geog. needs to latch onto real geog. A bridge is Google Earth and its Streetview, etc. Some thoughts while I have them in my head upon rereading old blog entries about this most central of all Frank Park locations, it seems. I am here to help. You have Grey Rock, you have Seal Stone. You have No Title Spring. You have the yellow brick road leading to the 50 bottles region no more [“Goodbye”]. 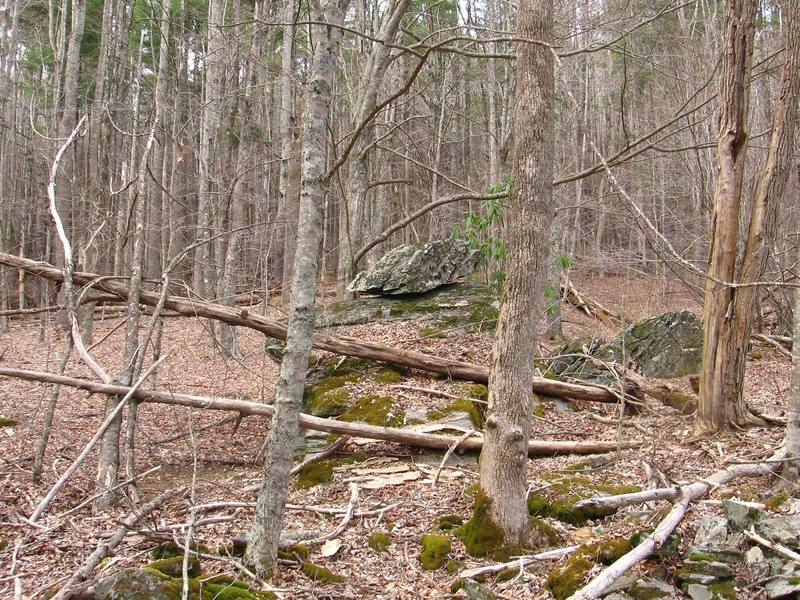 You have The Rocky Trail, which goes into and beyond Grey Rock. You have Rock the Rocket Man, who crash landed next to Green Stream and took The Rocky Trail to Green Turtle. Green Turtle was also known as Green Parrot. On this same finger of land is found Edward Stone, a bleedthrough of Edwardston, which also happens to be near a Green Turtle[ in Mythos]. Which of the stones is Seal Stone, Hucka D.? A choice. Some people go both ways — and so forth. I think I see. ‘Course the names could have shifted around. What about the Orange Hill? Castle Dundee. Home of Mr. and Mrs. Dundee. Who owned the dingo. Is there, then, a Line of Dundee? 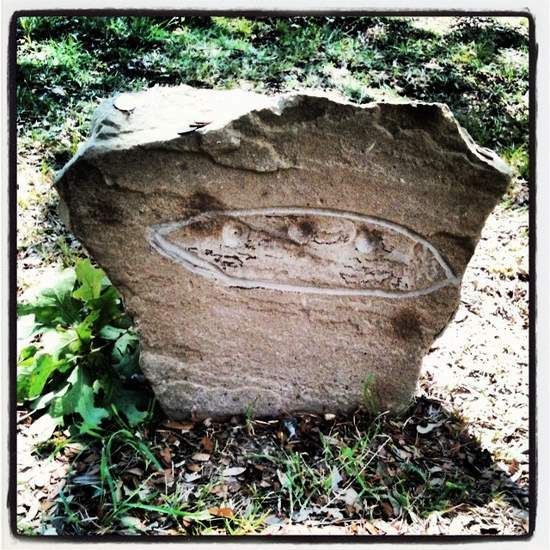 And then just a little more — I think Rock would have found The Grave and thought it to be Whitehead’s, the originator. Whitehead X-ing is such a complex area! You build on Fantasia Brick Road and take it to the next level. Also: Fairy House. Like Elton John is a famous fairy, in a positive way. The [diamond patched] tail wags the dog. 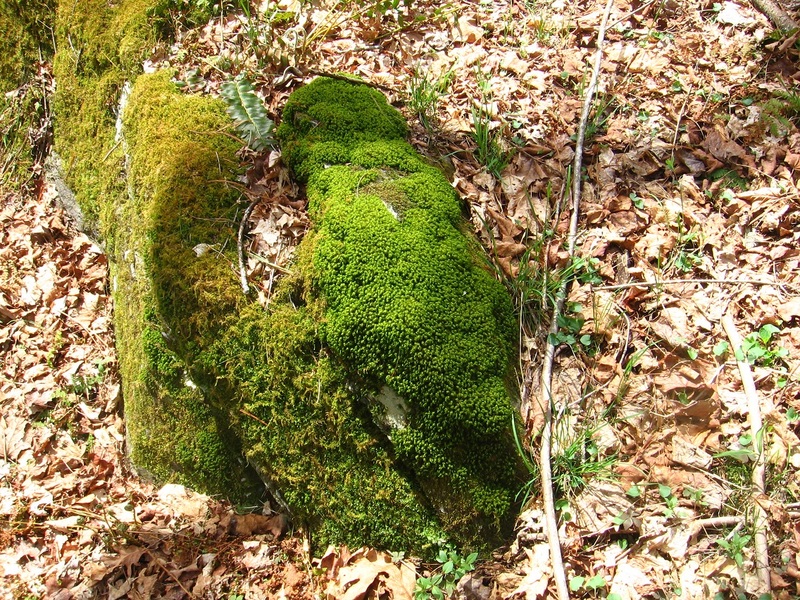 The same post talks about Rock’s grave, which is not his grave in the production shots of “Fade to Moss”. Wonder where Gene Fade is on that? 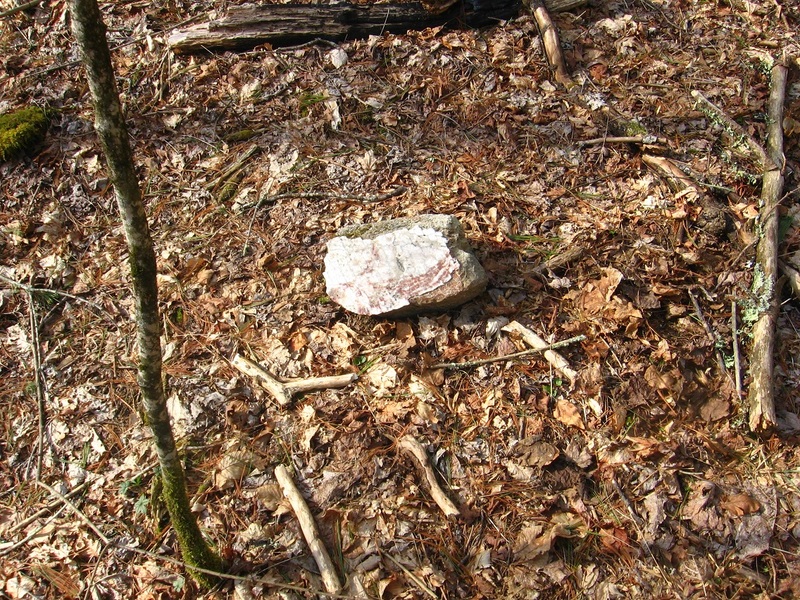 Rock’s grave, however, obviously strongly resonates with the tiny Dogpatch Cemetery only found very recently. 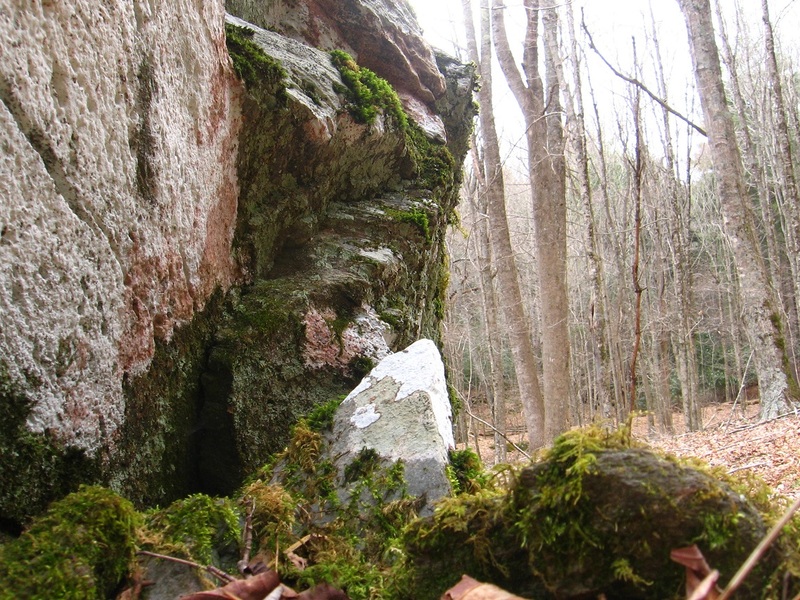 Rock, I believe, would have stumbled upon it — could have stumbled upon it — in his explorations of the area. When does Rock created his twisty turny tale, where he’s a bad guy instead of a good one? It’s to disguise his whereabouts and doings. He thinks like a syncher. Do the yellow bricks hidden at Tinsity come originally from Whitehead X-ing? I believe that Herman Park’s Billfork originates in Whitehead. 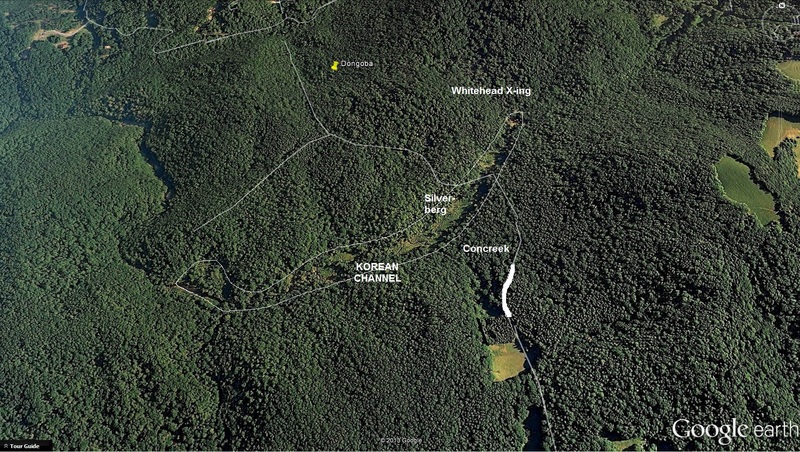 Mossmen used the Spoon Fork portal system to reach Green Stream and the Korean Channel. At the upper end of the Korean Channel is Whitehead X-ing; Jeogeorock, which is Grey Rock. Had the Mossmen already found other jeogeorocks? Possibility. They traditionally come from Moss Most, an original settlement far up Spoon Fork from Frank Park, just at the edge of where it knives toward Frank Park and the portal system. Then they reached another historical node at Mocksity, downstream, then also Notherton across The Way. This is where knife truly acts as a medium between formerly cross Spoon and Fork. Perhaps The Way had not even been created (until then?) — makes sense. Gene Fade, eventual actor in all those Salad Bar Jack adventure movies, born at Jupiter Rock above Nothernton, on what is called simply Gene Fade’s Mountain in this here blog. Some say the red spot on the rock is a jewel, perhaps a ruby. 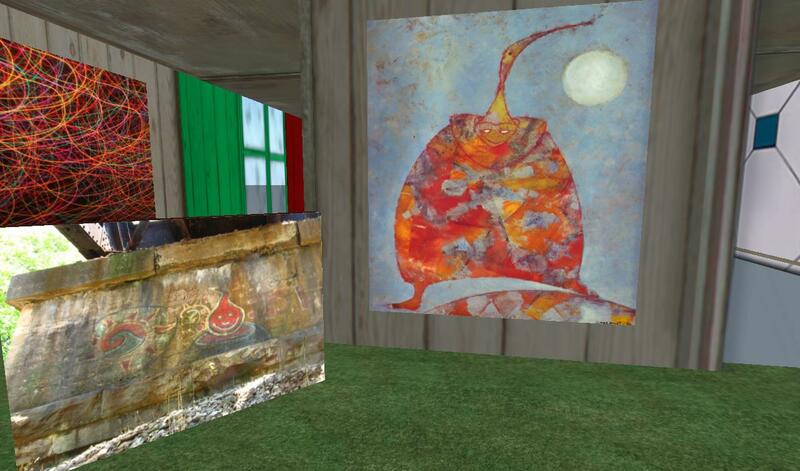 But related to this one found in Second Life on the yin-yang style Bracket Islands of the Corsica continent [LINK]. Gene Fade used [My Second Lyfe] avatar Karoz Blogger to create the ruby or jewel (or a virtual rendition of such? ), with, again traditionally, 32 prims or 32 facets. This is the Korean Channel. Gene Fade must have learned about the fabled Korean Channel while growing up in this Jupiter Rock/Notherton area. It was an ultimate destination, like Utah or Deseret was for the Mormons. Gene Fade desired greatly to go to this Korean Channel with its Green Stream (full of emeralds and rubies and diamonds?). News came from afar that the Korean Channel had been sealed up for the spring/summer months. Mossmen settled in Red Head beyond the upper end of the channel, but still on Green Stream. 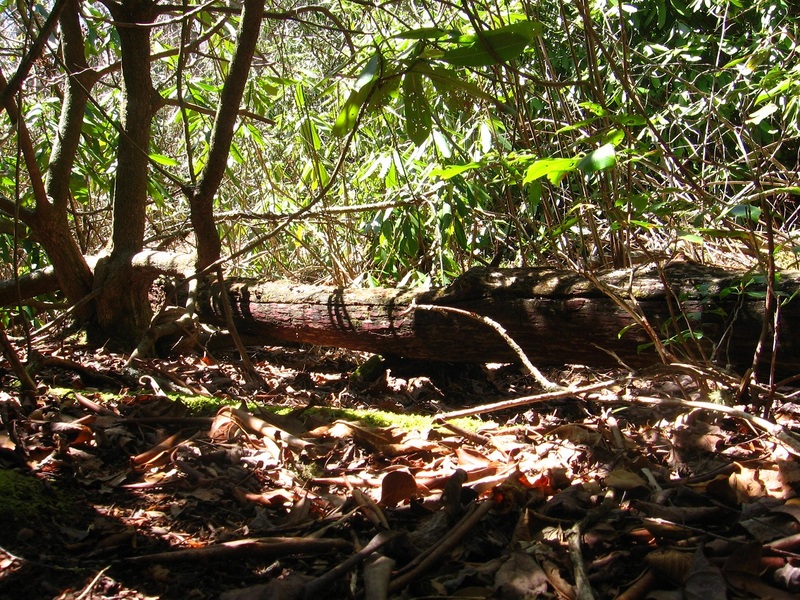 They hid… their avatar bodies able to move through the thick rhododendron, but allowing no human humans access (like me!). Mossmen first made friends with The Bees (like Hucka Doobee) at neighboring Greenhead, strongly resonating with the honeybee name origin of Deseret in fact. 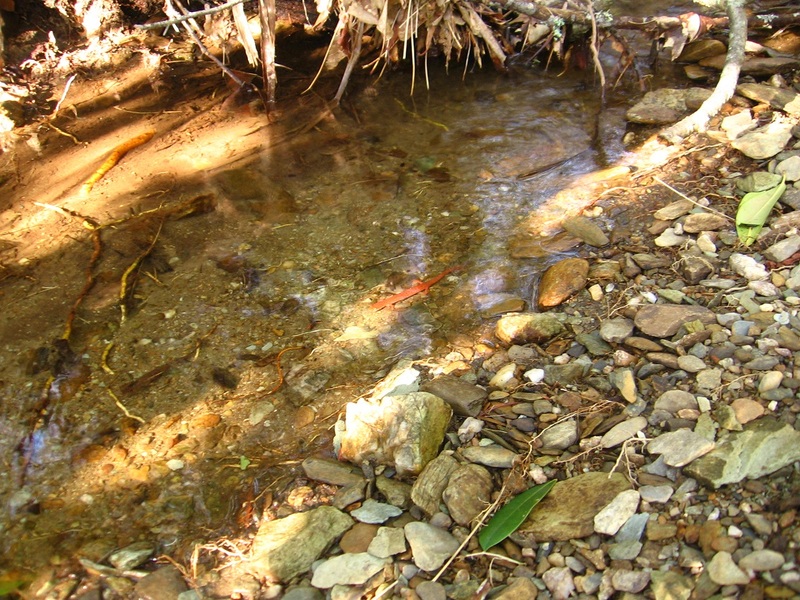 There was a confusion about colors… with Red Head at the head of Green Stream and Greenhead at the head of Red(stream) [LINK: MISSISSIPPI]. Another essential energy was added to the mix with the crash landing of Rock’s Rocket at the upper end of the Korean Channel, or at the lower end of Whitehead X-ing — what would become this city. He used The Rocky Trail to move into Whitehead Crossing proper (all the imp. rocks along this path have become legendary) and settle not in the modern version of the city but at the old Green Turtle/Edward Stone region between Whitehead and Little Whitehead. The crash would open up a portal to Maine as well, allowing a single fairy to escape from Monhegan Island there (through the overlapping Little Whiteheads). 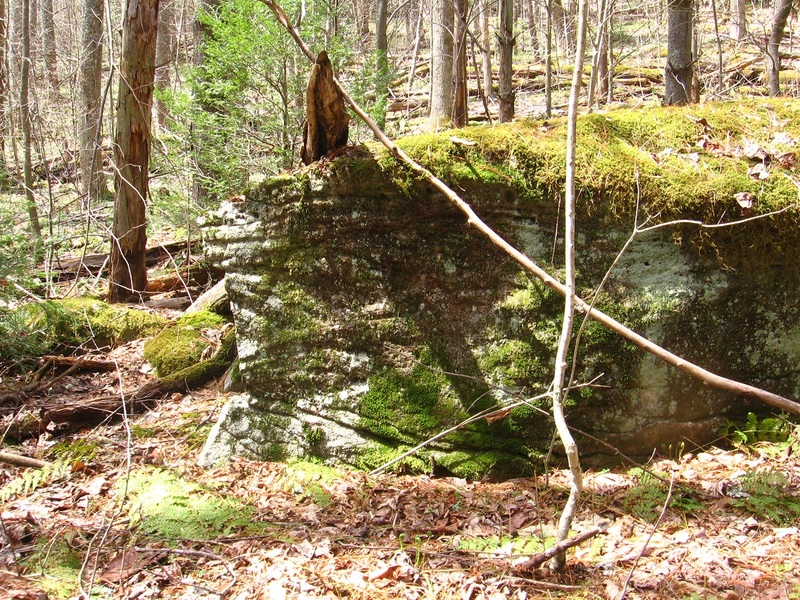 This fairy, larger than any of the rest on that island, was a psychic double to Rock, and created his home in the fairy meadow on the east side of Green Stream from the crash site. 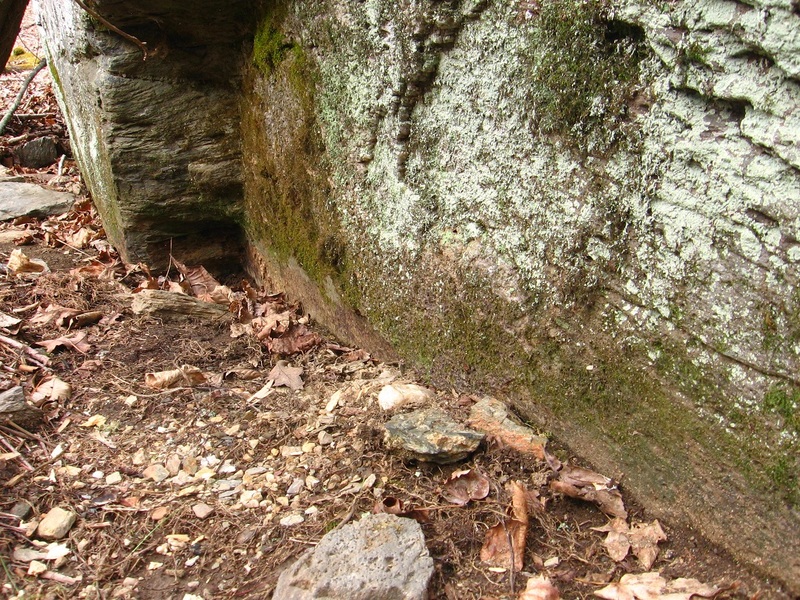 Rock’s crash also highlighted the importance of Grey Rock and its accompanying Seal Stone. But since Rock created a twisty-turny tale, disguising his actual story, the fairy could have also been Rock himself instead of his double. 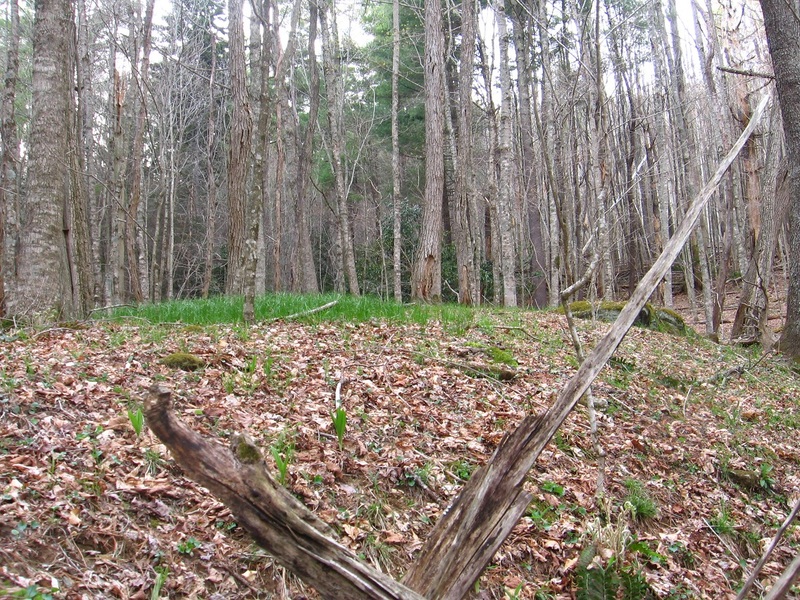 Continuing this Maine-Whitehead X-ing parallel, we have the Maine Trail, a play on words of Main Trail, which would be the main trail of the area, to the west of Whitehead X-ing and connecting Jacob I. Road with the now paved or asphalted Twisty-Turny Road (just coined!). Before I forget, there’s also probably a Crocodile Rock in Whitehead X-ing — maybe it is the same as the Green Turtle/Green Parrot, or yet another variant name of this formation. The could have even been a battle or a war over what the name was for this particular formation (Green Turtle vs. Green Parrot). Back to Rock… he would have passed Grey Rock with its Seal Stone on the way to Little Whitehead. He would have crossed Little Whitehead and entered Edward Stone proper (or whatever the town was named then — perhaps Green Turtle?) on the old fairy bridge (made by fairies but apparently the smaller or more traditional type). The fairies were hired from Monhegan Island (by whom?) So this “fairy bridge” becomes legendary and attached to Rock’s legacy as well. 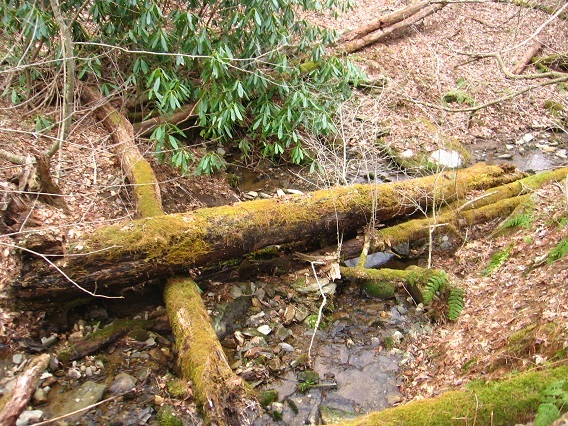 Another tradition says that he crossed into Edward Stone from the larger bridge at the present source of Little Whitehead, and over which you can clearly see the green turtle formation. Some variations of the story have The Rocky Trail paved with yellow or gold bricks, but this is false most likely — road too small or narrow? Instead the gold brick road was the old entrance into Whitehead X-ing, when Old Whitehead actually lived there. *Is* Old Whitehead buried at tiny Dogpatch Cemetery? But the story is certainly similar to Dorothy’s entrance into Oz — the crashed farmhouse is Rock’s crashed spaceship; the Rocky Trail is at least symbolically the Yellow Brick Road, and Seal Stone is the Scarecrow, who doesn’t know which rock is named such (some people go both ways, etc.). If there are parallels to Munchkins, they would be the meadow fairies. Back to Grey Rock and Seal Stone: the phrase “rocks for brains” also could be pertinent. Then Edward Stone is the Emerald City, complete with skyscrapers at the time. In fact, it had an unusually *high* proportion of skyscrapers to regular buildings. The population was about 20. 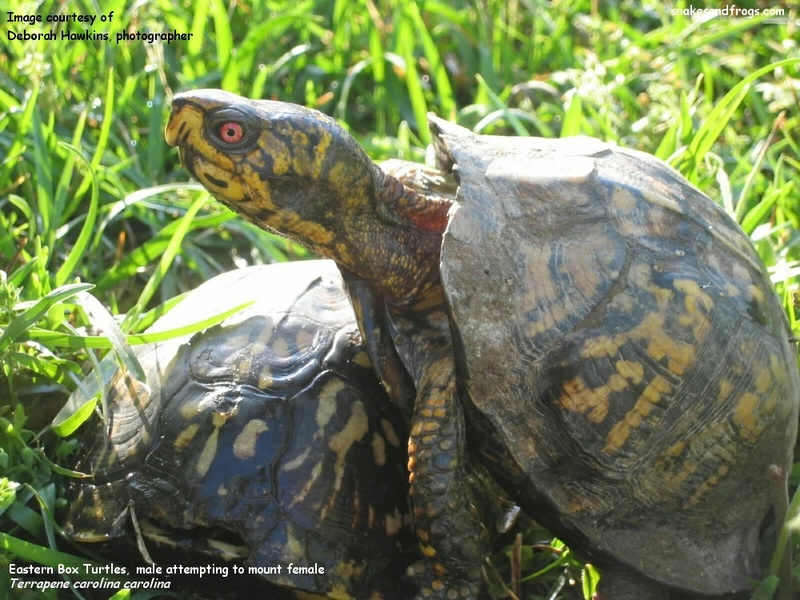 The population use to be 40, but was cut in half during the Green Turtle-Green Parrot battle/war, which ended in a draw. Therefore the population simply refers to it as part of the larger Edward Stone, and the city changed its name accordingly. Another mysterious part is the Orange Hill or Orange Cliffs, on which the Dundee Castle is perched, where Mr. and Mrs. Dundee lived. Their dingo use to be sighted as descending the cliffs, only to come back up as a fox. Or visa versa. The legend is in many art pictures of the period. Dingos descending represents the passage of life into death. Foxes ascending (to the Plane of Dundee) is death into life. They are Newborn on the Plane. 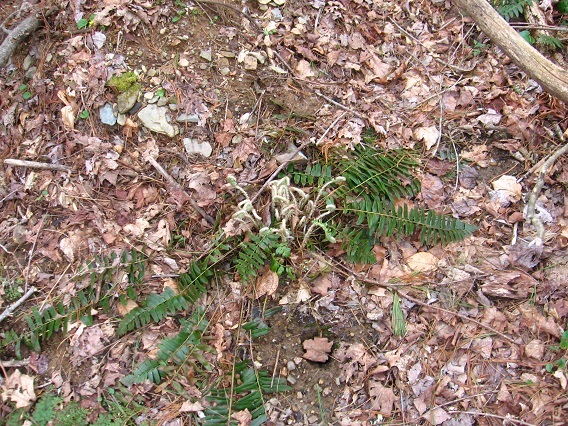 They die at the bottom of the cliff where it meets Whitehead Brook. All this could be seen from Knobby Log, which was also inhabited. 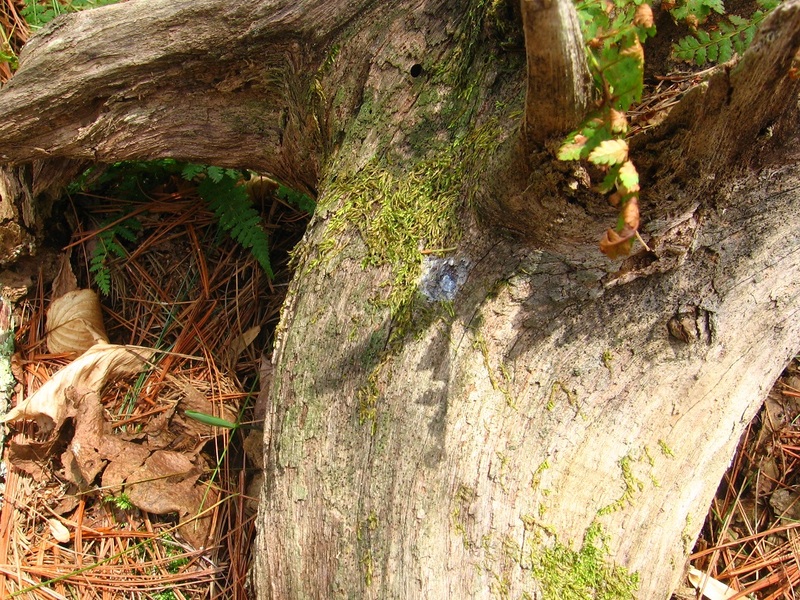 Knobs were homes — wood fairies once more? Then it would be sacrilege to give No Title Spring a name, according to the fairies (?). What did Rock find in Edward Stone? He found a population struggling to recover from the Green Turtle/Green Parrot wars. He made his home high above the town, but was able to see its skyscrapers still, so high they were. One skyscraper held the Art 10×10 (Wheeler-Jasper series). More fox-dingo images were within. There was an alignment of art galleries. And perhaps labyrinths at the same time. The Line of Art it was called. 39 people use to live in Edward Stone, and also 0.1 of a person known as [delete name]. The range was 38.9 to 39.3. 39 point 3 point what? The line ran across the Castle Dundee to Edward Stone, atop the Knobby Log. Because it was on the line, Castle Dundee was required to become an art gallery in due time. It resisted. There was a famous painting of the Panama Canal by Waverly Knapp (c1812), but was defaced by Rocket Man and his Rocket with “Sirius or Bust” scrawled upon its side. Mr. Dundee did not understand that this was part of the art, and painted over it. Correct. Of “Crocodile Rock” fame. Dundee and Alligator on opposite sides of a county. One important collage of the Art 10×10 was stolen from baker b., in turn, by a former art school acquaintance named Waverly Knapp (c1812). baker b. himself stole part of this painting-disguised-as-a-collage for his Gilatona-Lis series (c1812). Mouse Island was seen as the destination of death, where the fox descended down to from the Plane of Dundee and its Dundee Castle. This is also the Promised Land (of Gill’s Pier). To keep from entering the promised land too soon, baker b. avatar must move the Pier’s Gill wagon atop the Cliffs of Dundee, a difficult task in the painting but easier in actual life (cliffs not nearly as high as in the painting). Important also is the triangle of elements in the painting “Cliffs of Dundee”. Critics knew that the green mouse of the painting was R. Booger Hayes’ Mouse Island, and the Promised Land where the true nature of the island is allowed to “play out” (like the green mouse plays the guitar in the painting). The children around him are [white-ish] rocks — Rocks Von Trapp. The Green Mouse is also known as Captain or Capitan. He earns this title in the Promised Land. Also obviously important are the images of Green Turtle in painting. Oil painting was seen as highest art, like the high castle of Dundee atop the cliffs. Mr. Dundee, the person of High Octave (Art), made sure this was understood. So the collage formerly known as Jasper 04 became the oil painting known as the “Cliffs of Dundee”. In this way it is much like Max Ernst’s Elephant of Celebes, an oil painting also based on collage principles, and perhaps also indistinguishable from a collage from afar. 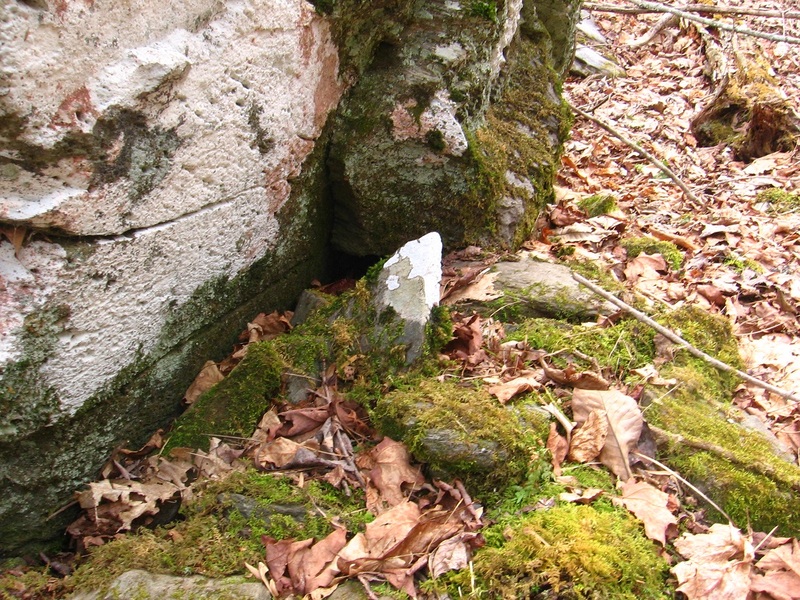 … possible name source for Whitehead X-ing is this moss covered rock with white quartz, perched above Little Whitehead, and downstream from a similarly perched Edward Stone and its Green Turtle, Hucka D.
A rock beside it also has a prominent spot of white quartz. The shape of this quartz marking may also be important. A fish? Of course, the name could come from White Rock next to what I’m perceiving to be Seal Stone, or one of 2 prominent candidates for this stone. 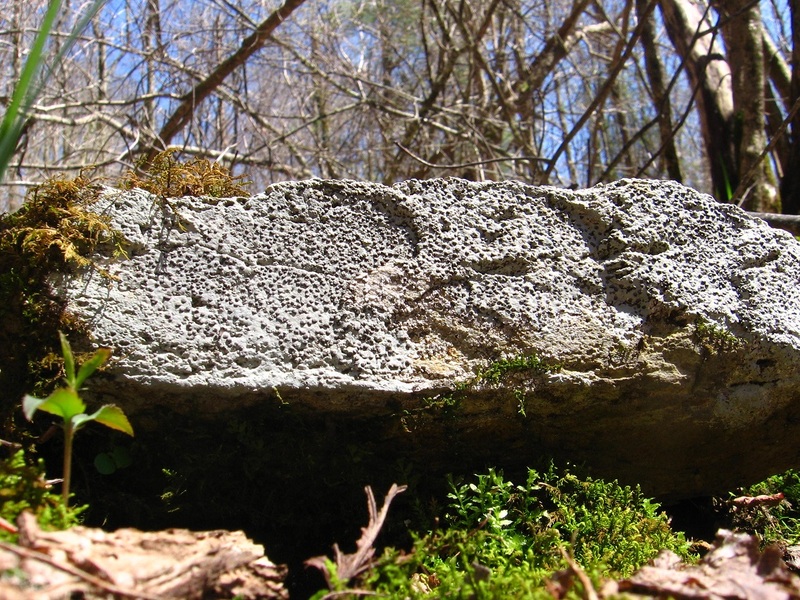 Seal Stone (left) and Grey Rock (right); or is Seal Stone instead the topping rock of Grey Rock? Either one. You know Edward Stone is the stone with Green Turtle on its upper side. Named for Edward I, who was in the area. We also call the ever-green grass in the center of the ridge separating Whitehead Brook and Little Whitehead The Emerald, Hucka D. Logical decision, given that Mythos’ Edwardston, with its prominent Green Turtle suburb, is also the largest city of Wazob’s Emerald Province. It’s also been identified with Oz’s Emerald City. 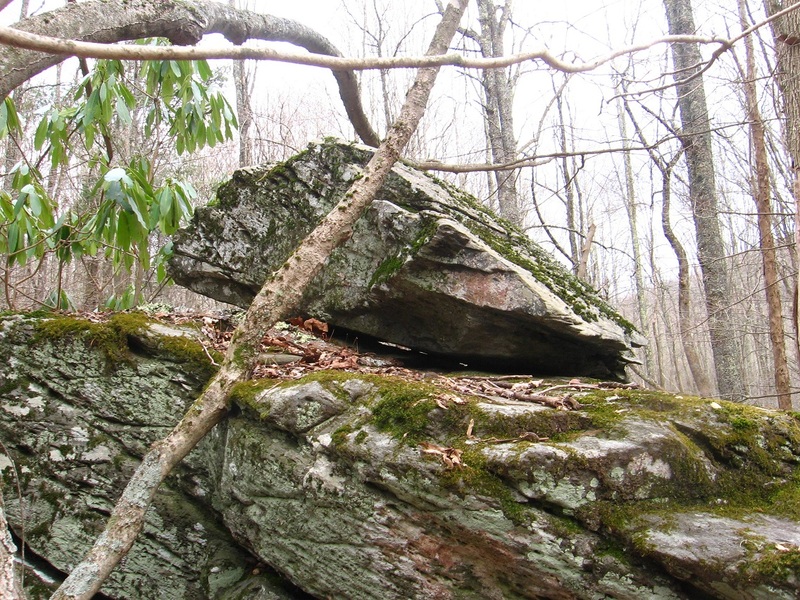 It could be that Grey Rock itself was called Seal Stone in the past, Hucka D. The topping rock, or the rock on top of the rock, could have instead been Grey Rock, or just Grey. 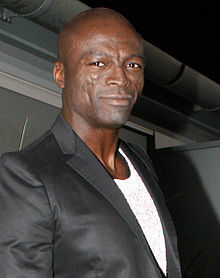 And if Seal Stone is this topping rock, does it *open up*? What’s inside Grey Rock, Hucka? Too many questions[ for now]. Tempted to buy more Second Life land, currently, bumping up to an 8192 or maybe even a 8192 + 4096 if I continue to rent. This would only be feasible if I either rented all this land, or either the 8192 or 4096. Last year about this time is when I founded Carrcassone on the Maebaleia continent, with 8704 square meters of space. But it only lasted 2 months, and in the second month I didn’t work on it much at all, even. Probably looking at the same situation for a new space. The other option is just keep renting my 4096 + 1024 and delete all but the Power Tower Gowlery, using the rest as a sandbox in prep for VWX-Town. 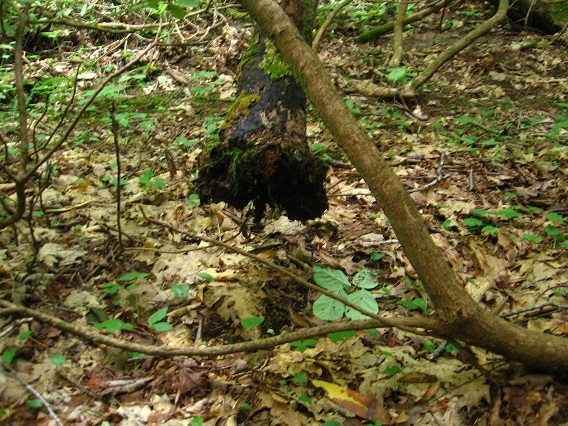 The woods will close up soon, as poison ivy sprouts (saw my first sprigs yesterday will hiking up Greene Knob), and bugs and snakes and such come out in force. Nevertheless I am going to attempt to keep visiting Whitehead X-ing, take more pics and develop more mythology, maybe even create some collages based on my photos of the place. Whitehead X-ing is long term; very excited about recent developments such as expounded on especially in this post just below. In other subjects, I plan to finish up typing out The High Octave Story in the next week or so, then start on Edna’s Altanta story fragment and/or Merging Tracks. Edna is typing up her part of our projected collaboration as well (“Bark”). Maybe we’ll have the bare bones in place before our England trip. Must also think of the carrcasses. Thinking of re-creating Billfork even before we leave. Work on The Table. Carrcass-8 is coming up, but probably not until we get back. Don’t bump up on Netflix before then. Return to Wiltshire via Google Earth in early May. Join crop circle archive and study maps of where crop circles have formed down through the years. Read more circle material — finish Lamb book. Start reading Faulkner. Don’t start any more collage series right now. 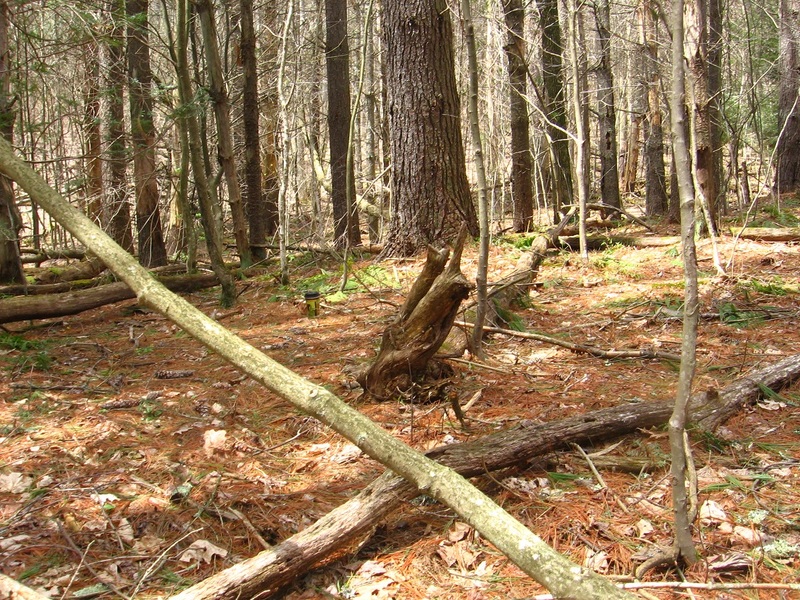 Keep working on woodsy mythology around here — push it as far as possible but not too far. The Emerald (seemingly permanent green grass atop Little Whitehead Ridge) changed from Evergreen at some point. So the 4 parallel sticks in 4 Sticks can be directly related to drum sticks per the wikipedia article on the track. Only US Sticks near Stiltz in PA. 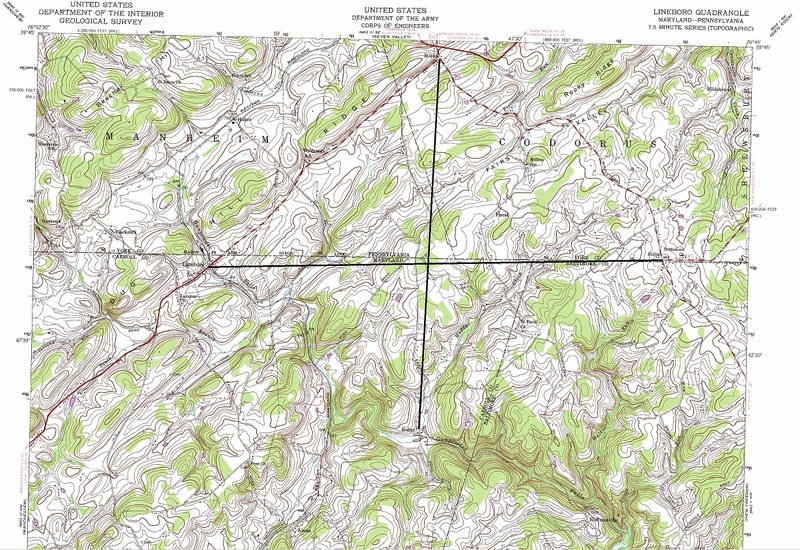 Both are on Lineboro topo map as well, and are alphabetically next to each other in the total list of 62 pop places of this map. Sticks and stilts are both lines. Lineboro on Mason-Dixon Line, hence name. This line is the same as the MD/PA border. Stiltz is on this same line. 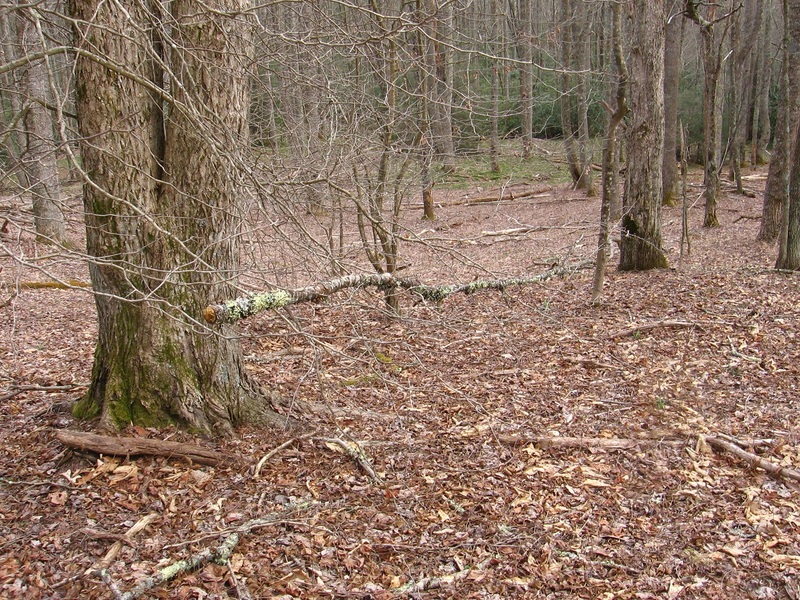 Whitehead X-ing’s 4 Sticks sticks or limbs are *lined* up in a horizontal row on the forest floor. Stilts in contrast are vertical when in use. Playing drums w/ 4 sticks and walking long distances with stilts are both remarkable and improbable feats. NOTE: Create or xerox/copy Mythos map with Emerald Province and Edwardston, Green Turtle, Sealson, et al. Copy same from “Notebook I”, with analysis. In that early or basically “first” notebook (1981), Sealston is assoc. with the number 2, and Edwardston with the following number of 3. 2 represents exteriorization from 1 (Confederation/Mythos), and elsewhere in the notebook connected with Earth’s moon as similar gravitational escape. Sealston in Whitehead X-ing terminology translated to Seal Stone, as Edwardston does to Edward Stone. 3 follows 2 as stabilization of exteriorization. Numbers 2 and 3 may transfer as well. Edwardston traditional 3rd largest city of Wazob, and on 3-4-5 golden triangle with Gillalex (4) and Calypso (5), fully transferring Confederation (Mythos) energy to Wazob, it seems. 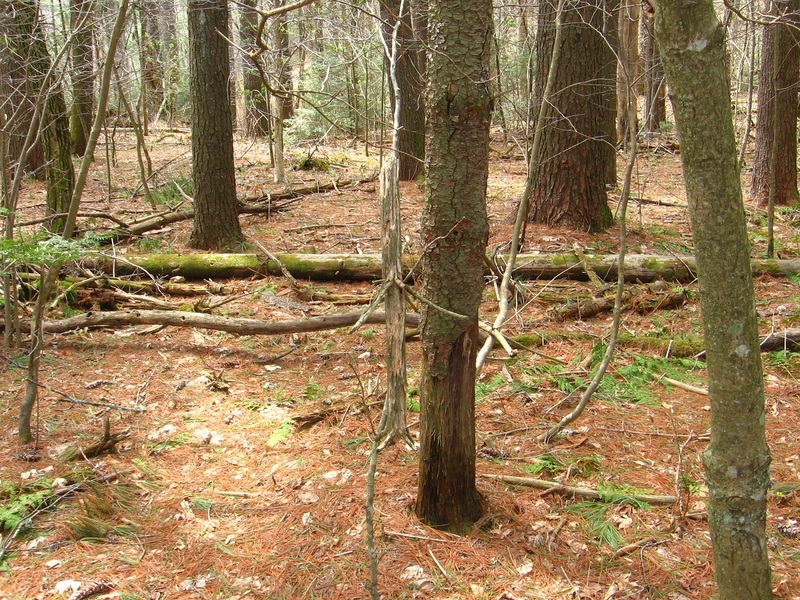 2 lines (2 sticks each, seemingly), horizontal and vertical, are traditional sticks (on ground) and stilts (perpendicular to ground). 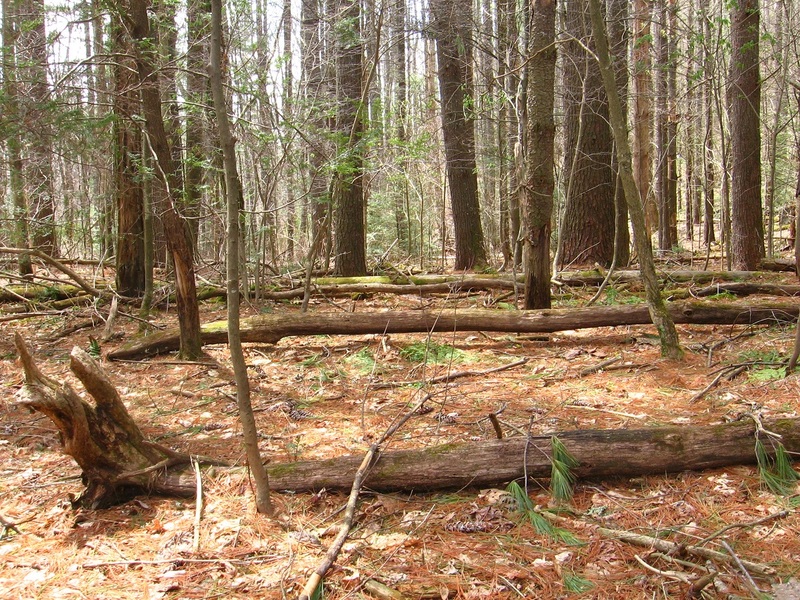 But Sticks, PA is on vertical line here, indicating stilts, and Stiltz is on horizontal line with Lineboro, and on Mason-Dixon Line (very famous line, or archetypal line). Could represent off (stilts off, thus laying horizontally on ground) and on (stilts in use, thus perpendicular to ground). Roller is the 4th element here and appears to stand for roller skates (or roller blades), another archaic means of transportation like stilts, but sans sticks in this case. Mason is north (blue) as Dixon is south through Dixie (gray). Confusion of up/down/right/left(wrong) in our US of A, like during the Civil War. Very interesting as well that Roller + population place comes up with 5 entries in GNIRPS (new name! ), the one near Lineboro in the above map, and then one which instantly stood out among the other four, in a Mason & Dixon County also in Maryland (like Roller), but 1 whole longitude degree to the west. The primary name for this population place is Fairview Mills, also known as Fairview Roller Mills (and hence the appearance). Both are on almost the same latitude line as well. Very funny that Rockdale is by far the nearest village, and Fairview Mills itself is on Rockdale Creek. Indication: rock and roller or rollers, like certainly Led Zeppelin members were in their times. Also on the ZoSo album is the track “Rock and Roll”. We were recording another number [Four Sticks]; we’d just finished a take and John Bonham did the drum intro and we just followed on. I started doing pretty much half of that riff you hear on Rock n Roll and it was just so exciting that we thought, “let’s just work on this”. The riff and the sequence was really immediate to those 12-bar patterns that you had in those old rock songs like Little Richard, etc, and it was just so spur-of-the-moment the way that it just came together more or less out of nowhere. Do you sense the synch energy spread’n out?? *I* was having trouble nailing down an interpretation of Sticks/Stiltz/Lineboro/Roller, with Roller the last addition. I knew it somehow represented “4 Sticks”. Then in GNIRPing Roller, found the Fairview Mills “Roller” strongly assoc. with “Rock”, and made the link with Zep’s “Rock and Roll”. Then in googling “Rock and Roll” found the intimate connection with “4 Sticks” from the same album, which was likewise “interrupted” by “Rock” and “Roll” as it were. Make sense? OH, and Rock and Roll/4 Sticks were released on same single as side a and b respectively. How peculiar! Oh baby I got to fly. ‘Cause you know I gotta get away from you babe. Oh baby the river’s red oh baby in my head. I don’t think I can hold out long. Baby baby baby how do you feel? ** Sticks and stilts and rollers! I believe the Mossmen knew of their relation with Mormons (Latter Day Saints) when coming into contact with The Bees of Greenhead at the top of the Korean Channel. The Bees may have made them aware of this. “You are like The Mormons”, they explained, and said the Mormons, when finding The Bees, knew they had reached Zion or the Promised Land. “We will show you everything about this land because it has been prophesized that you would come,” The Bees then said. “But there is one more to enter,” which turned out to be Whitehead or Blue Skies Mr. “For The Mormons, the prophet was at the beginning of their history. For you Mossmen, the prophet only surfaces at the end of your journey, after you found your own Zion here at [Whitehead X-ing]. Now we only have to wait.” And wait they did, for — years, until Rock’s Rocketship crash landed at the top of the Korean Channel. 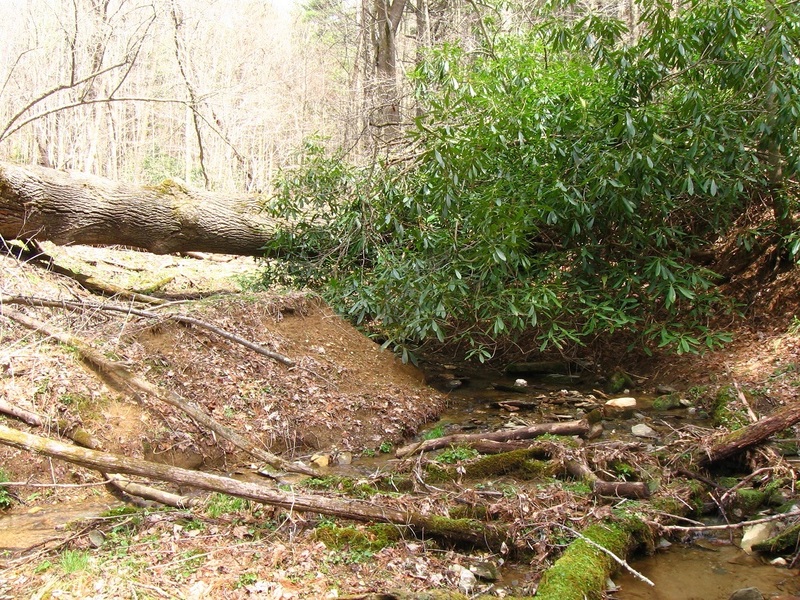 A fairy from Maine enters Whitehead Crossing at the same time, and establishes a home to the east of Green Stream from the crash site. The Bees have prepared Little Whitehead for the coming, creating the Green Turtle (for example). Rock would see the Green Turtle, and know he had entered 3 (Edward Stone) beyond 2 (Seal Stone). He had reached Home. The Emerald was also prepared there. The bridge at Green Turtle/Edward Stone as well. Rock knew he had to create Home on this finger of land between Whitehead and Little Whitehead. The Fairy had already left the area, but was the first settler. The Fairy exited (east) as Rock entered (west). Rock sorta kinda took his place. This was the only way Fairy could escape in first place? Fairy put out an ad: come to Whitehead Crossing and replace me and allow me to be set free. Well, he probably disguised the “being trapped” part. But Rock was eager to take a role in the cosmos, and applied from his home in Syncher Creek Designated Mystery Area (designated afterwards). “Your grave becomes the grave of the Unknown” at Dogpatch, explains Fairy to Rock, after Fairy is set free. They talk via “telephone”. Dial phone. The Mossmen would spread out and settle the whole Korean Channel and beyond, much like the Mormons spread out and settled the Mormon Corridor. One was able to first dial a telephone at “4 Sticks” in Whitehead Metro Area. White Rock is like an illuminated finger doing the dialing. White Rock is a pencil doing the dialing. A Rock and Roller answers. It’s Elton, but not to be confused with Elton John. But it still could be Elton John if you know what I mean (I don’t). “What did you say you were?” ask The Bees, already snickering. “Mossmen” came the answer. “Mossmons?” came The Bee’s reply, pretending to misunderstand. More snickering. Main Mossman (Mossmain) said, “no”, without humor. “I said Moss*men*”. The Bee clicked and shook his head. “So close, so close, what a shame.” The Main Bee (Hucka?) looked over his should at the others, then returning, saying “Because the bees and I.. we’ll, we thought it might be *Mormons*.” All The Bees erupted into full laughter, some doubled over, some on the ground rolling. The Main Bee then attempted to explain: “You don’t get it. This has happened all before, Mossmons”, for the Main Bee was to joking refer to the Mossmen as Mosmons from now on, always to laughter or giggling or snickering if other bees were accompanying him. “Who are these Morrmons?” returned Mossmain, who also shook his head but out of confusion instead of mock indignation. The Bee explained that the Mormon’s prophet came at the beginning, but for the Mossmen it was at the end, after they had already found their personalized geographicalized Zion. (NOTE: Zion mentioned in HT a little before the “Korean Channel”).